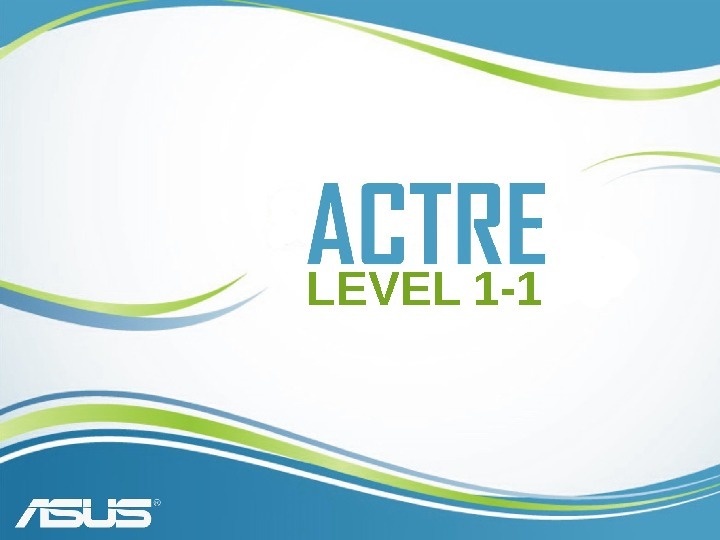 22 All recipients of this document must treat this training material as ASUS confidential and must not disclose it to any party other than the recipients’ employees on a need to know basis, or other individuals authorized under a written Confidential Disclosure Agreement signed by ASUS and the recipient. Statement of Confidentiality. Notebook System Level 1 Training Material Ver. 4. 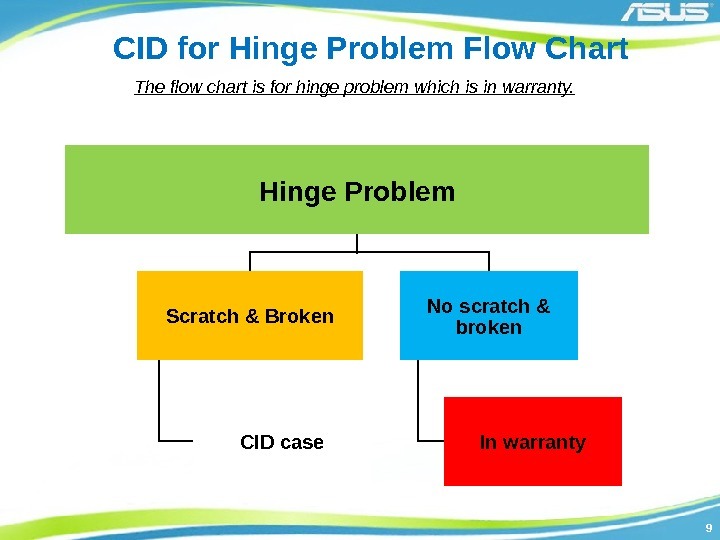 99 CID for Hinge Problem Flow Chart Hinge Problem Scratch & Broken CID case No scratch & broken In warranty. 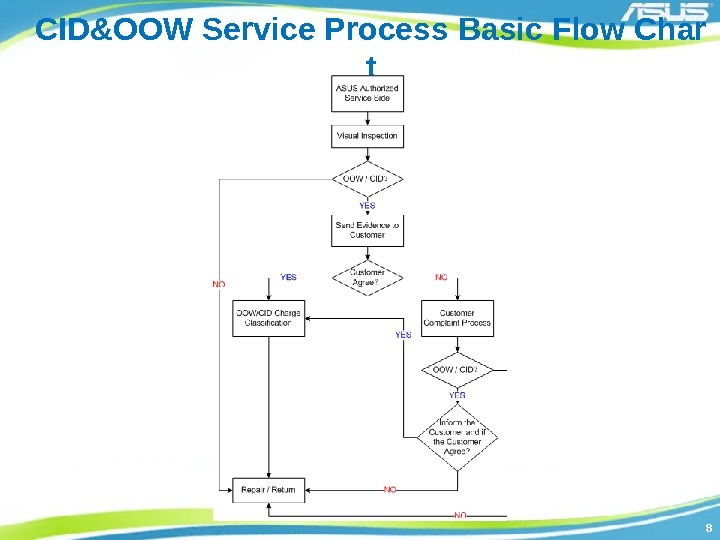 The flow chart is for hinge problem which is in warranty. 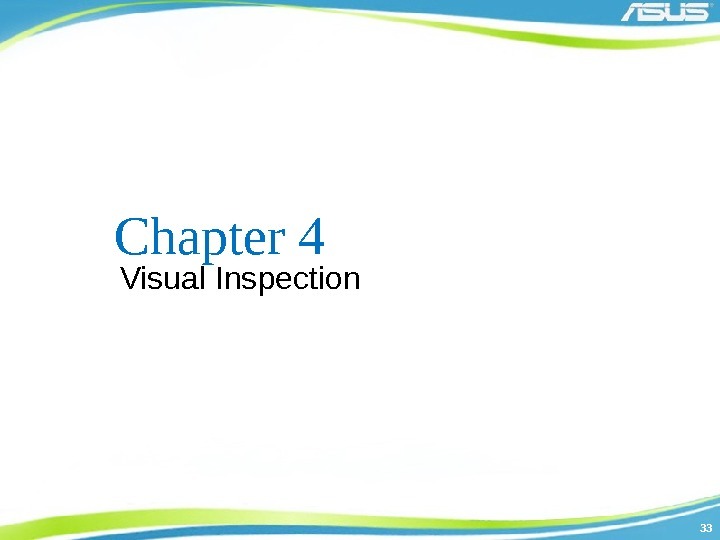 3434 Visual Inspection Manner 1. 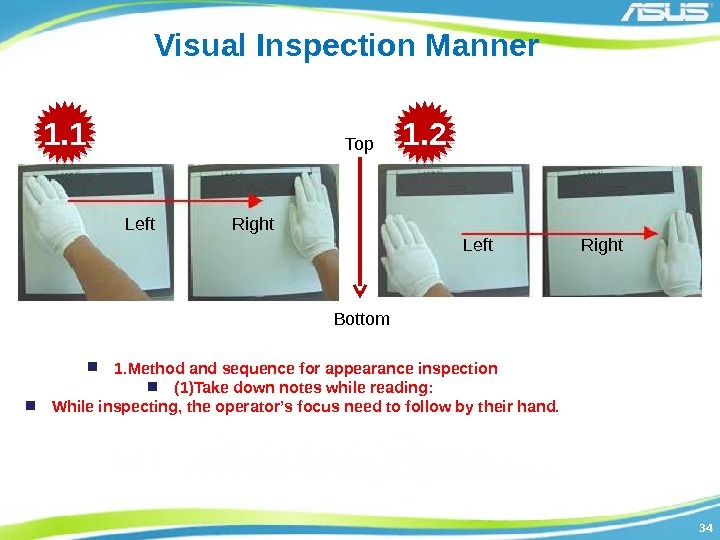 Method and sequence for appearance inspection (1)Take down notes while reading: While inspecting, the operator’s focus need to follow by their hand. Left Right Top Bottom Left Right 1. 1 1. 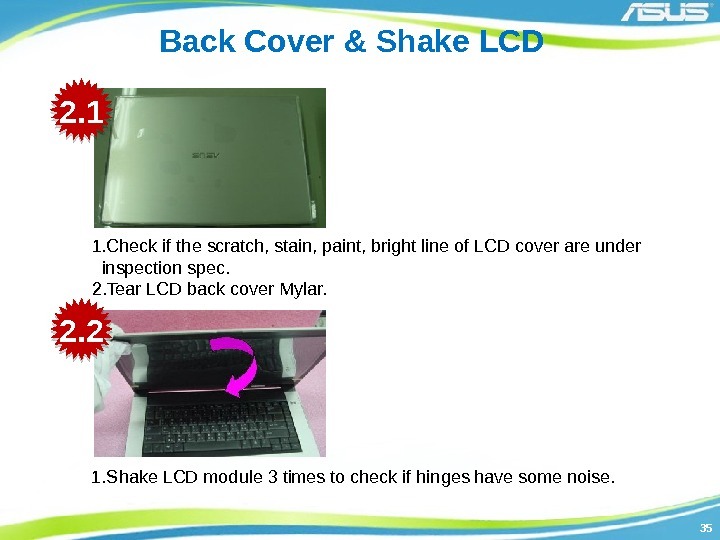 3535 Back Cover & Shake LCD 1. 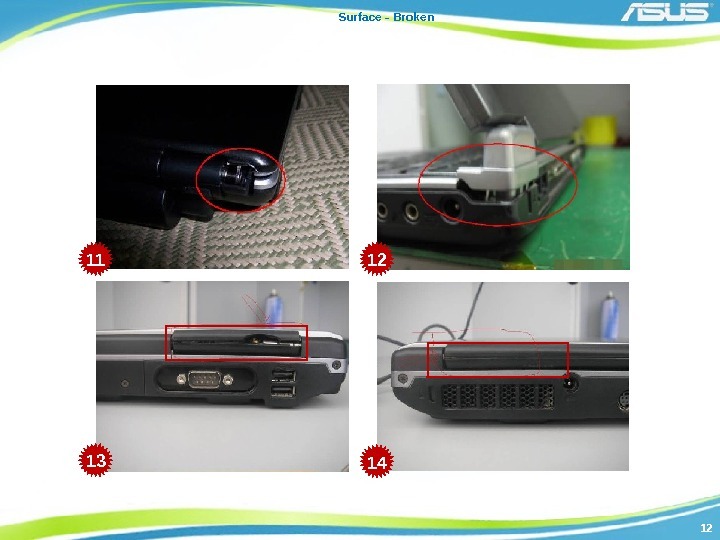 Check if the scratch, stain, paint, bright line of LCD cover are under inspection spec. 2. Tear LCD back cover Mylar. 1. Shake LCD module 3 times to check if hinges have some noise. 2. 1 2. 3636 Check Bottom Case 1. Checking if the gap in the bottom case is under spec. 2. 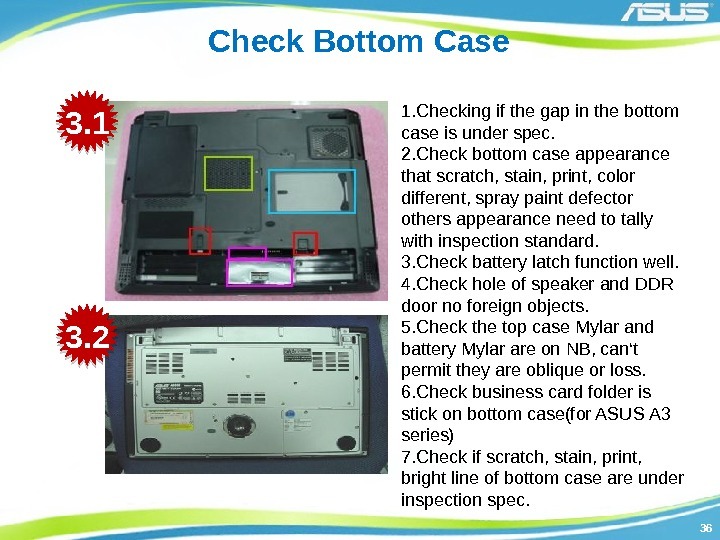 Check bottom case appearance that scratch, stain, print, color different, spray paint defector others appearance need to tally with inspection standard. 3. Check battery latch function well. 4. Check hole of speaker and DDR door no foreign objects. 5. 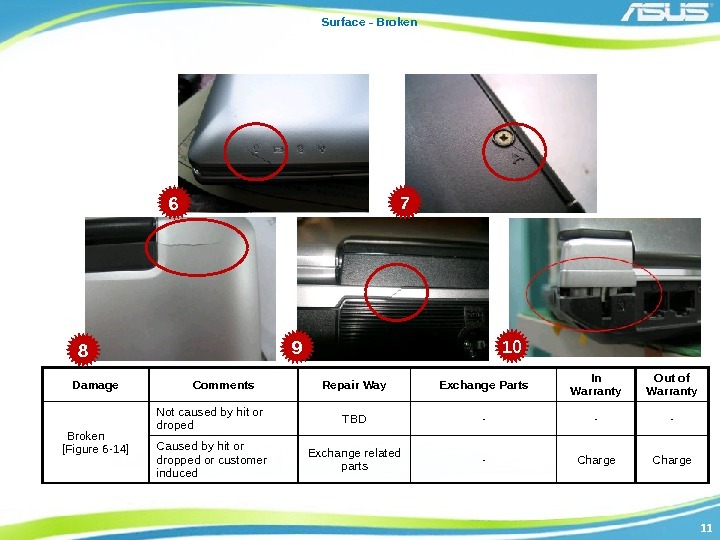 Check the top case Mylar and battery Mylar are on NB, can‘t permit they are oblique or loss. 6. Check business card folder is stick on bottom case(for ASUS A 3 series) 7. 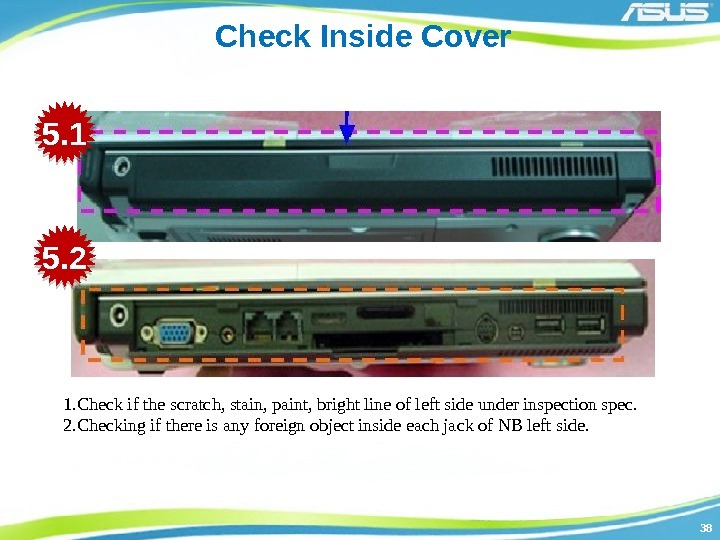 Check if scratch, stain, print, bright line of bottom case are under inspection spec. 3. 1 3. 3737 Check Border Area 1. 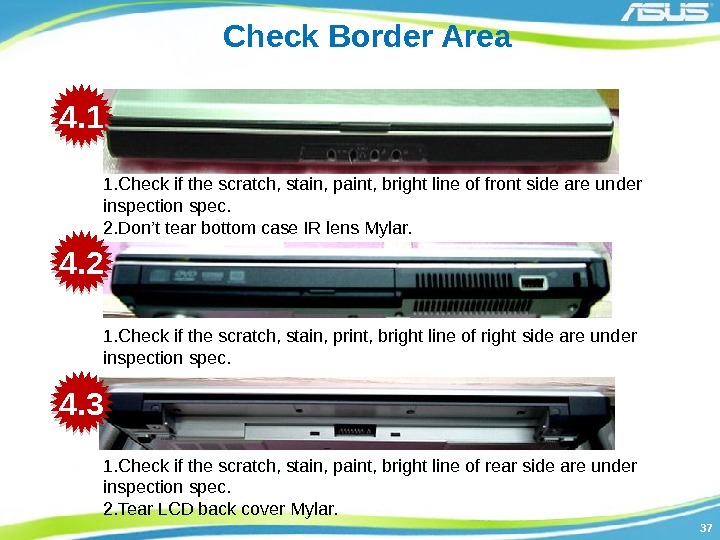 Check if the scratch, stain, paint, bright line of front side are under inspection spec. 2. Don’t tear bottom case IR lens Mylar. 1. 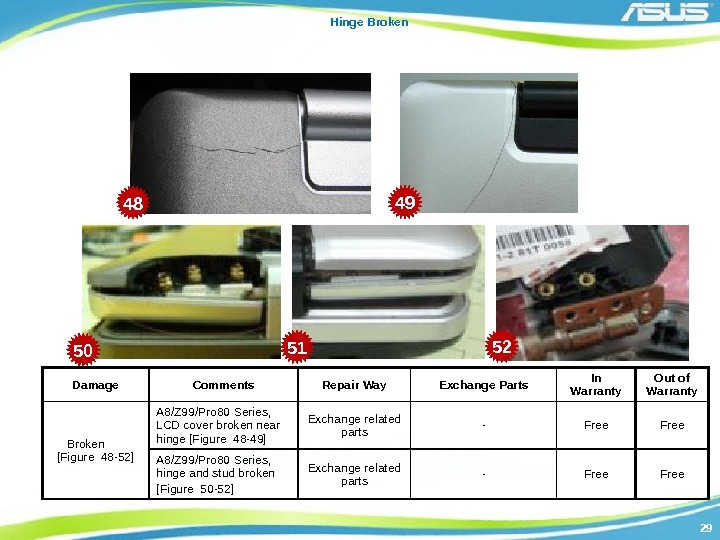 Check if the scratch, stain, print, bright line of right side are under inspection spec. 1. 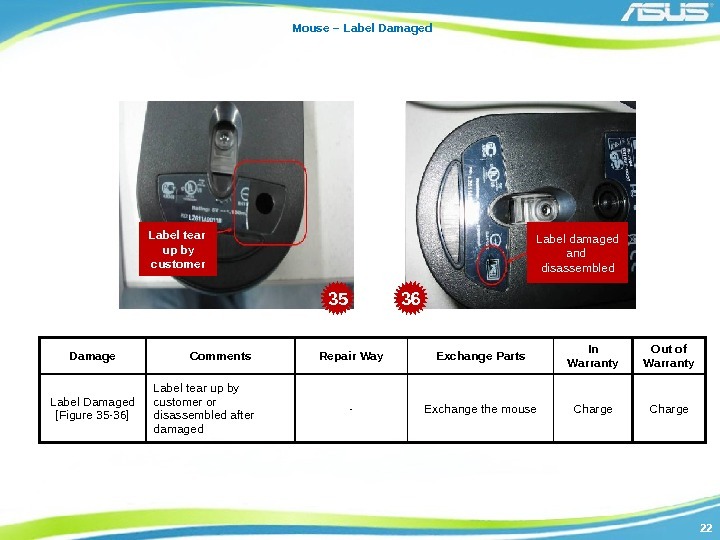 Check if the scratch, stain, paint, bright line of rear side are under inspection spec. 2. Tear LCD back cover Mylar. 4. 1 4. 2 4. 3838 Check Inside Cover 1. 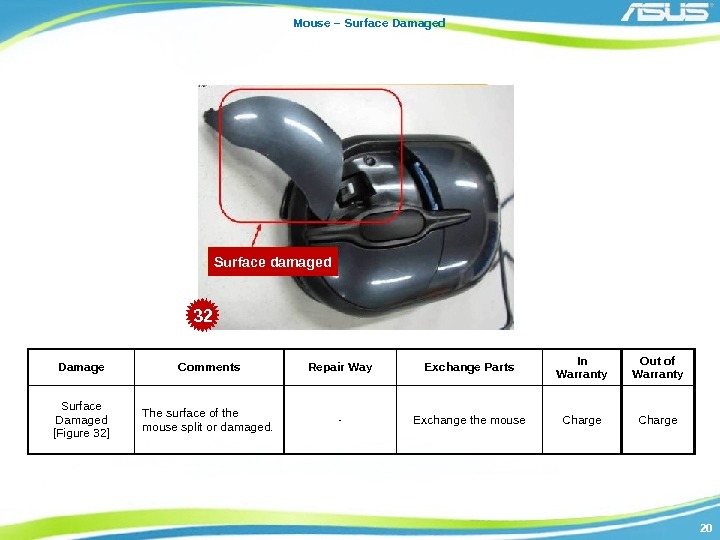 Check if the scratch, stain, paint, bright line of left side under inspection spec. 2. Checking if there is any foreign object inside each jack of NB left side. 5. 1 5. 3939 Check Gap & Device 1. 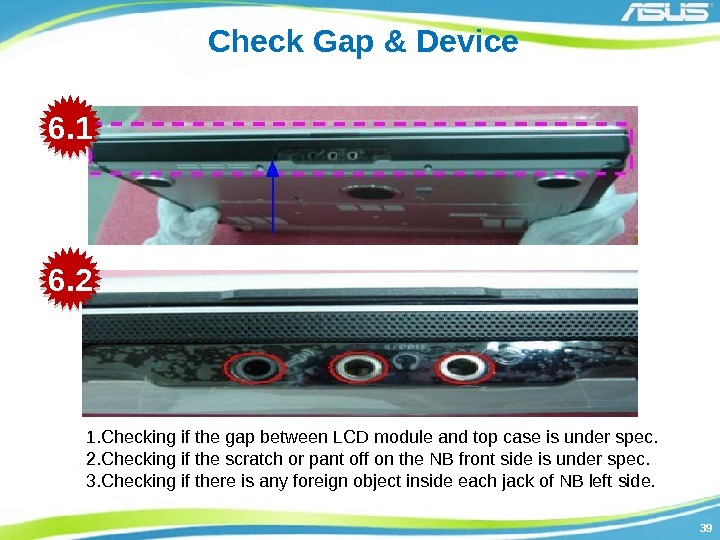 Checking if the gap between LCD module and top case is under spec. 2. Checking if the scratch or pant off on the NB front side is under spec. 3. Checking if there is any foreign object inside each jack of NB left side. 6. 1 6. 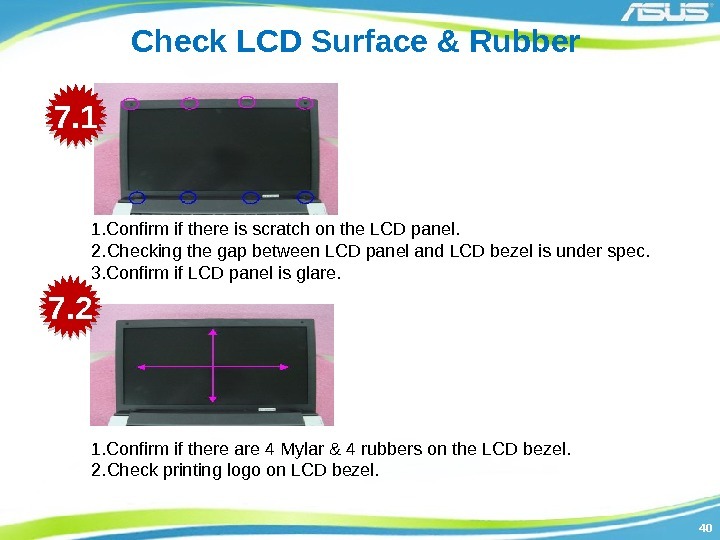 4040 Check LCD Surface & Rubber 1. 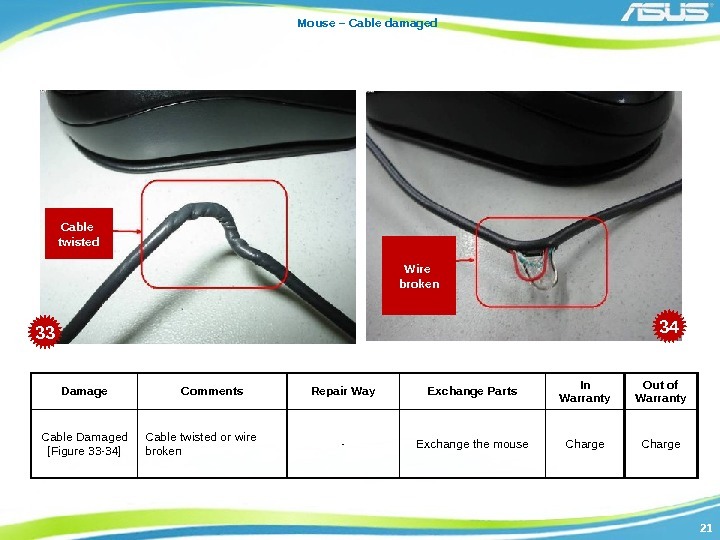 Confirm if there is scratch on the LCD panel. 2. Checking the gap between LCD panel and LCD bezel is under spec. 3. Confirm if LCD panel is glare. 1. 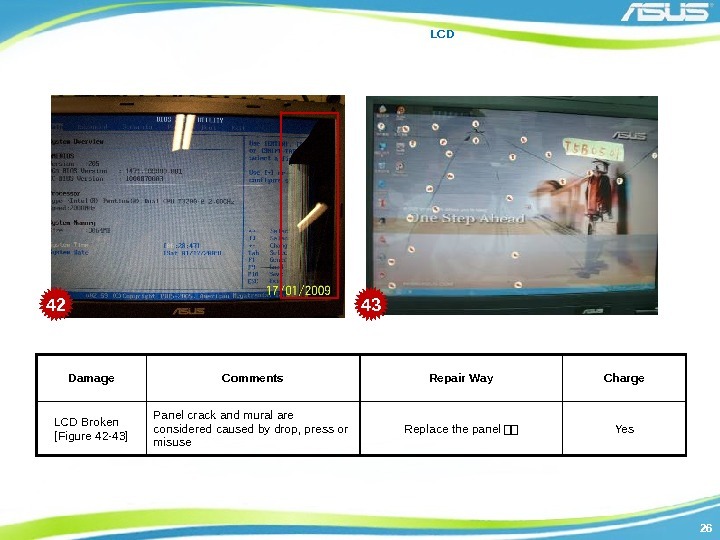 Confirm if there are 4 Mylar & 4 rubbers on the LCD bezel. 2. 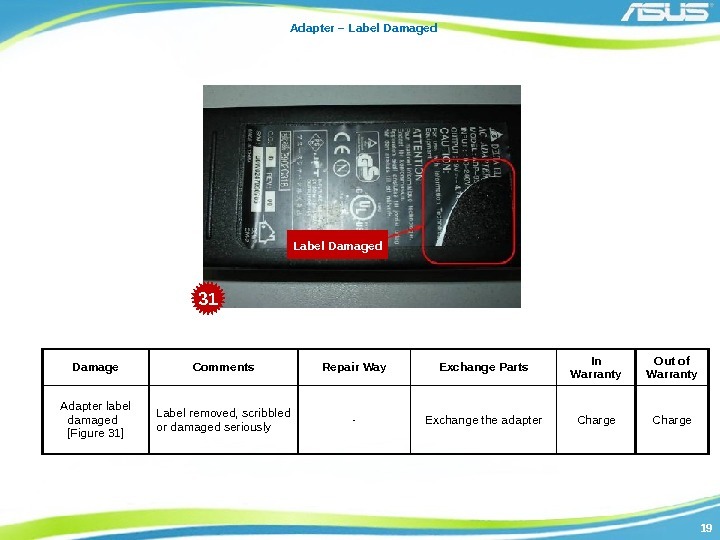 Check printing logo on LCD bezel. 7. 1 7. 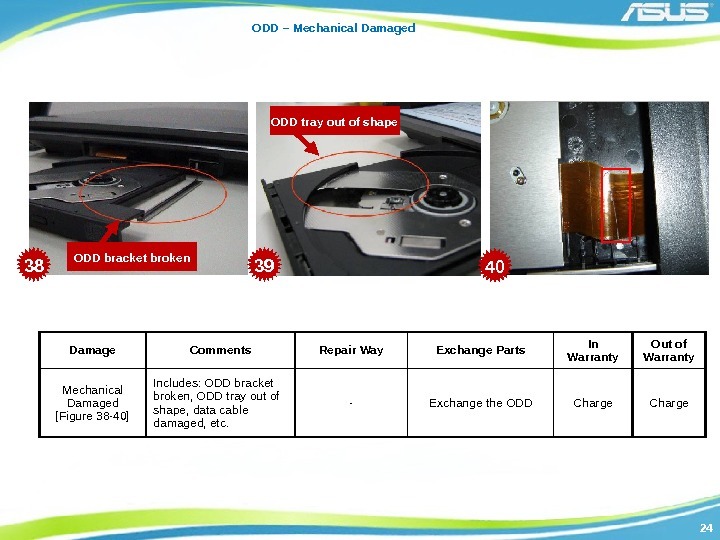 4141 Check PCMCIA & Top Case 1. 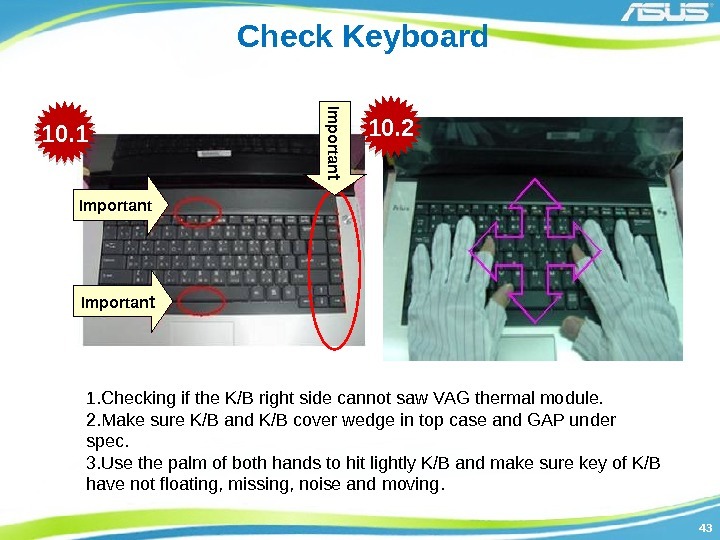 Check if the PCMCIA push button function well. 1. 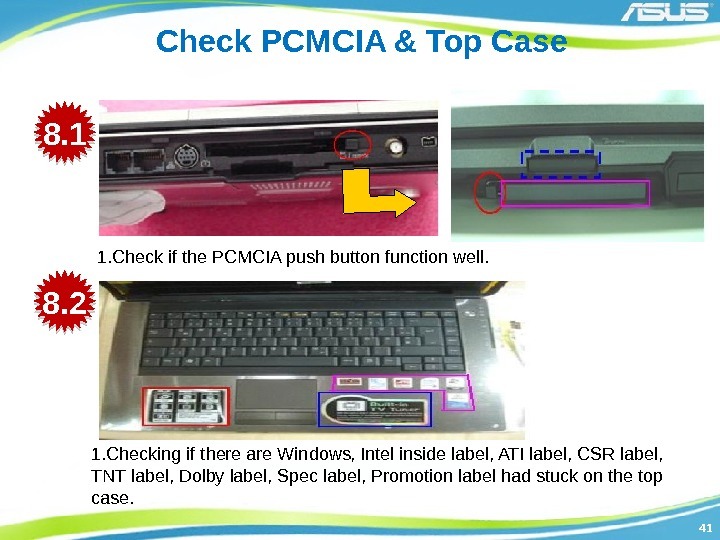 Checking if there are Windows, Intel inside label, ATI label, CSR label, TNT label, Dolby label, Spec label, Promotion label had stuck on the top case. 8. 1 8. 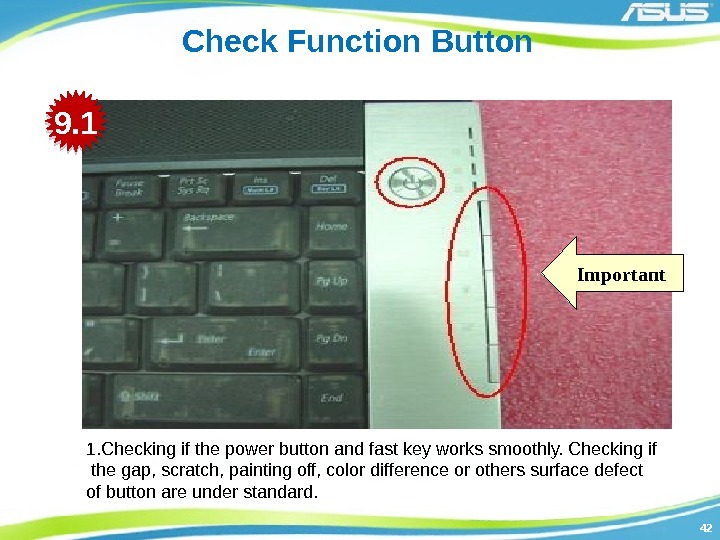 4242 Check Function Button Important 1. 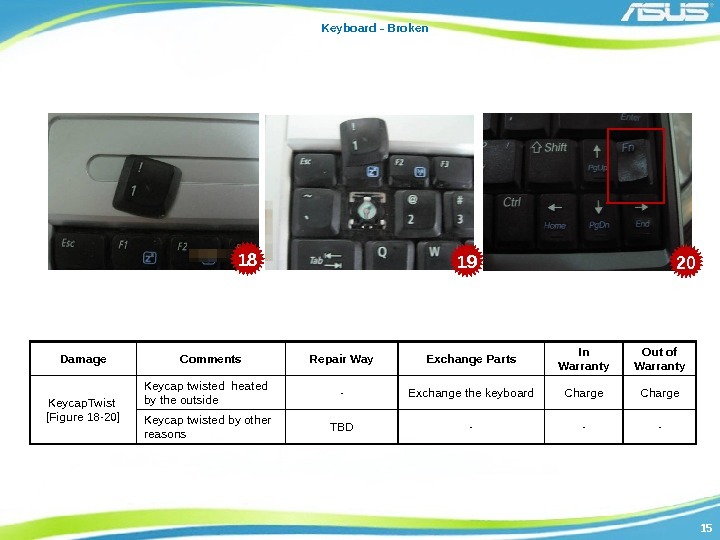 Checking if the power button and fast key works smoothly. 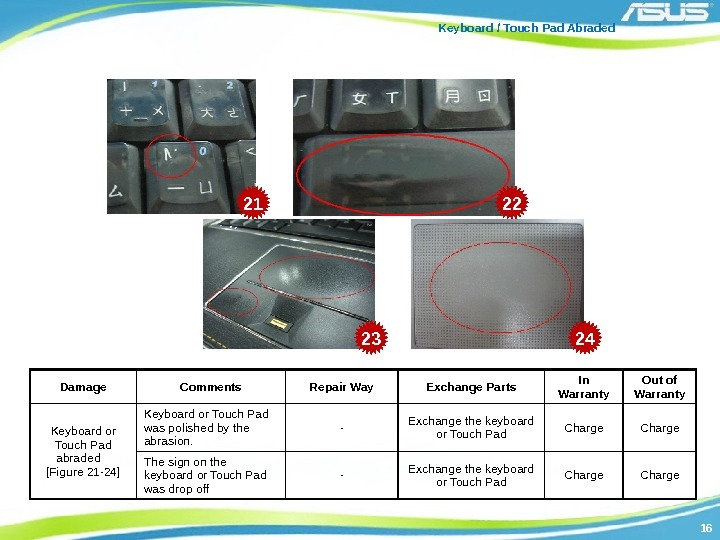 Checking if the gap, scratch, painting off, color difference or others surface defect of button are under standard. 9. 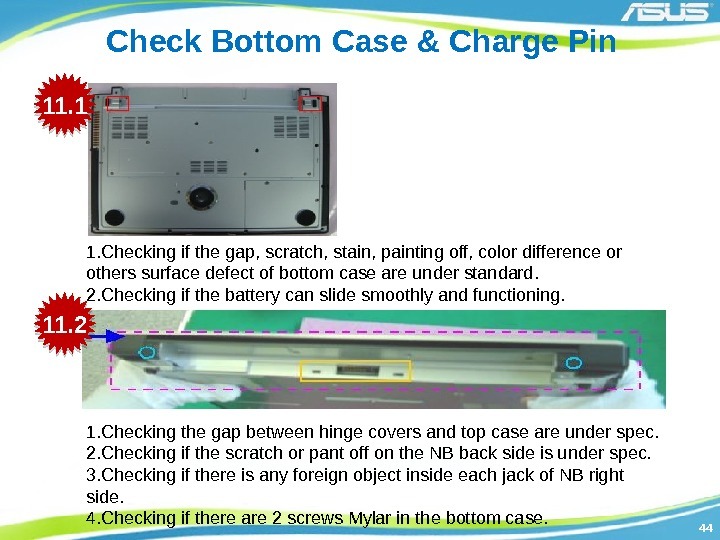 4444 Check Bottom Case & Charge Pin 1. 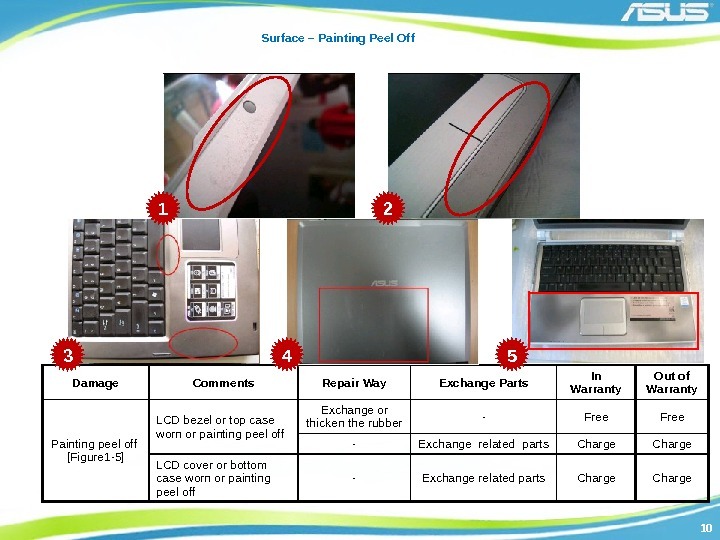 Checking if the gap, scratch, stain, painting off, color difference or others surface defect of bottom case are under standard. 2. Checking if the battery can slide smoothly and functioning. 1. Checking the gap between hinge covers and top case are under spec. 2. Checking if the scratch or pant off on the NB back side is under spec. 3. 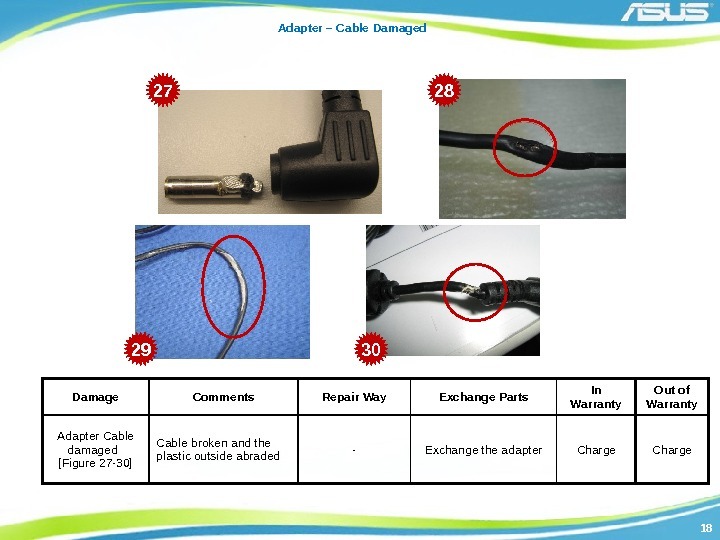 Checking if there is any foreign object inside each jack of NB right side. 4. 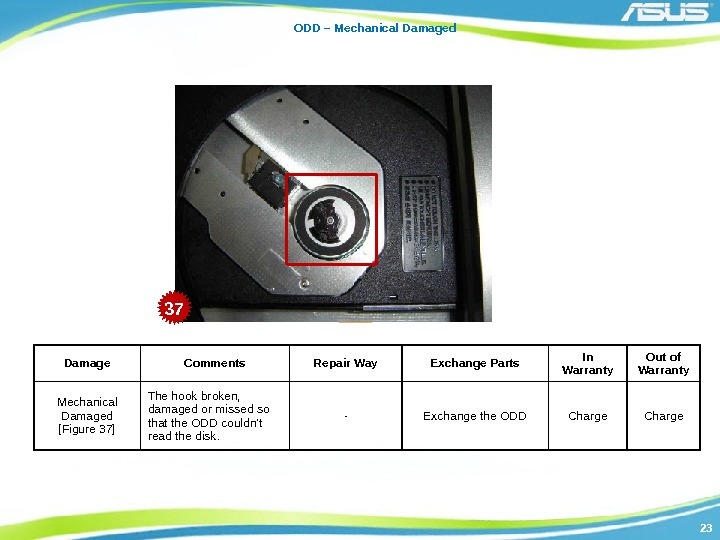 Checking if there are 2 screws Mylar in the bottom case. 11. 1 11. 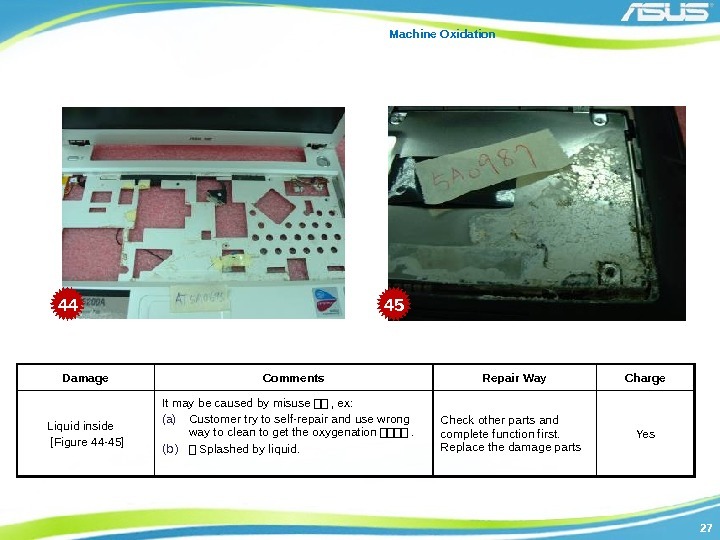 4545 Check Battery & Warranty Label Check machine model number Name EX: W 5 AELabel cannot stuck over frame. 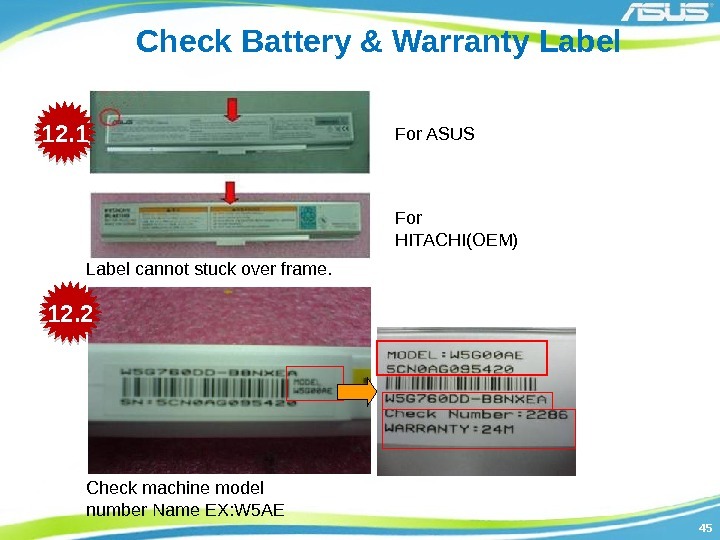 For HITACHI(OEM)For ASUS 12. 1 12. 4646 Check All Label & Cotton Paper 1. 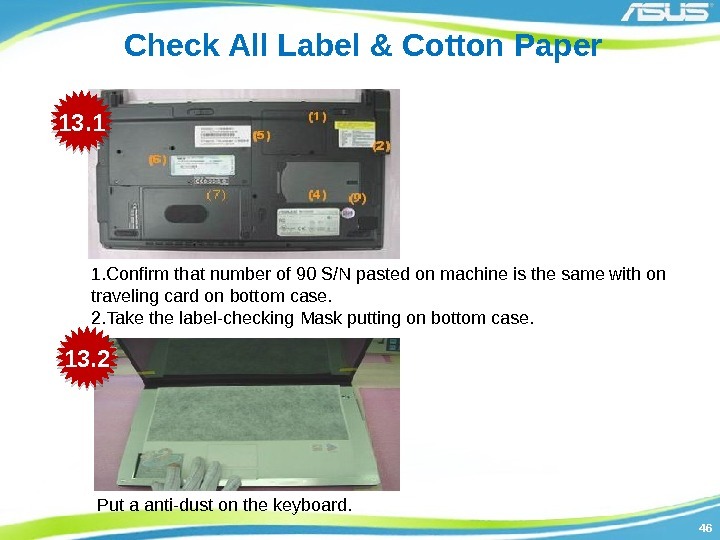 Confirm that number of 90 S/N pasted on machine is the same with on traveling card on bottom case. 2. Take the label-checking Mask putting on bottom case. Put a anti-dust on the keyboard. 13. 1 13. 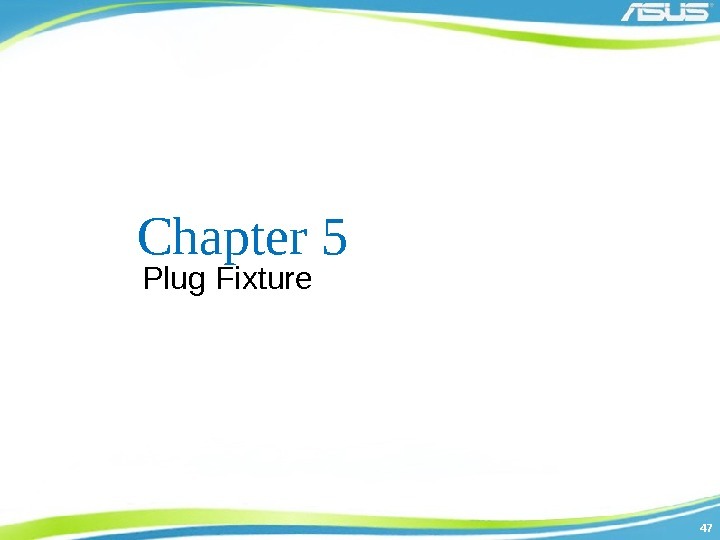 4949 Plug Fixture 3. 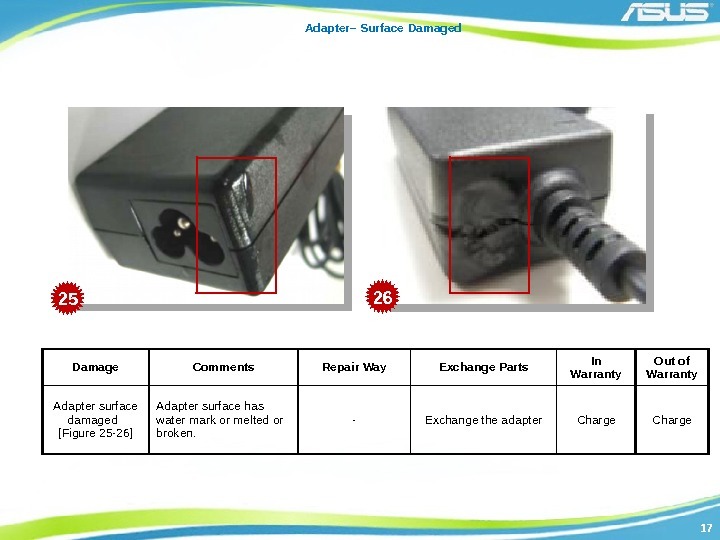 Connect USB port plug. 3 4 4. 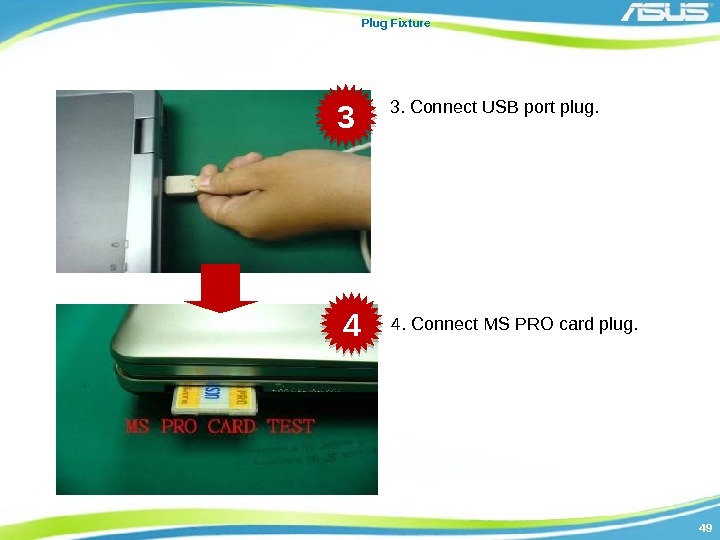 Connect MS PRO card plug. 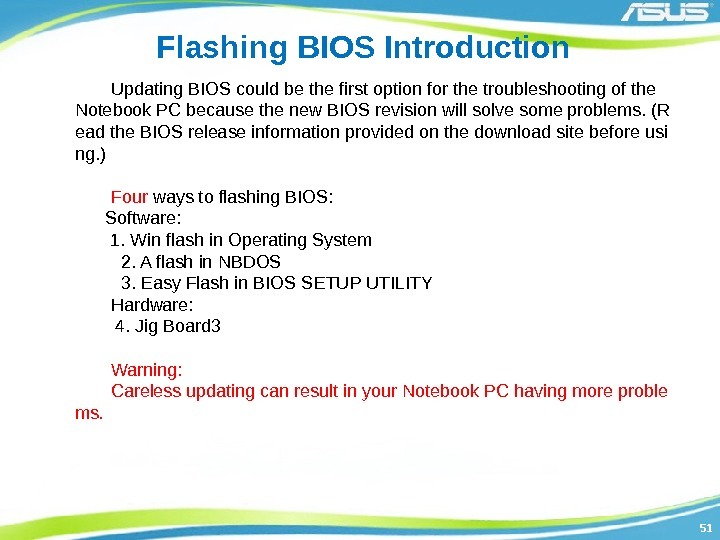 5151 Flashing BIOS Introduction Updating BIOS could be the first option for the troubleshooting of the Notebook PC because the new BIOS revision will solve some problems. 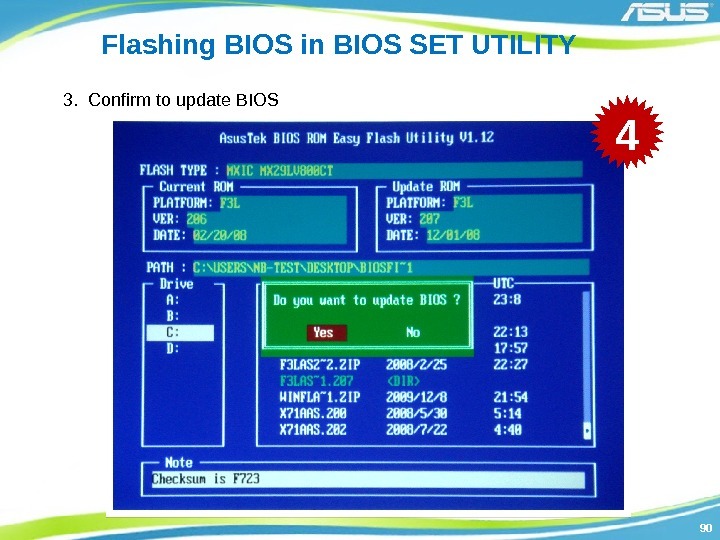 (R ead the BIOS release information provided on the download site before usi ng. ) 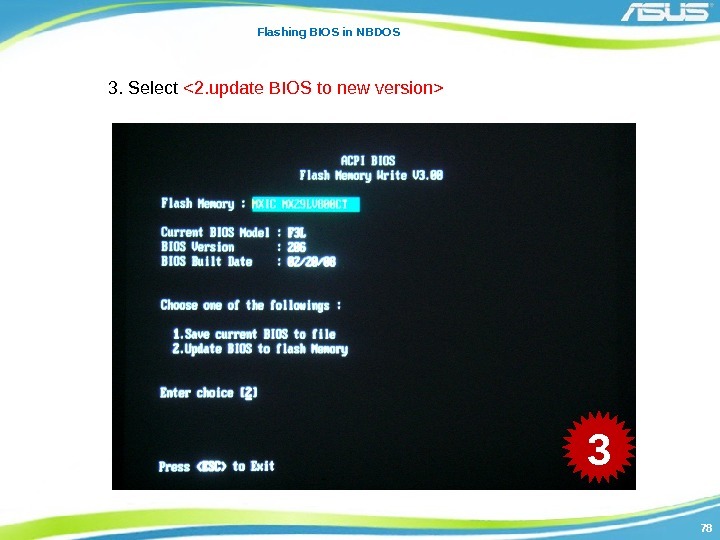 Four ways to flashing BIOS: Software: 1. 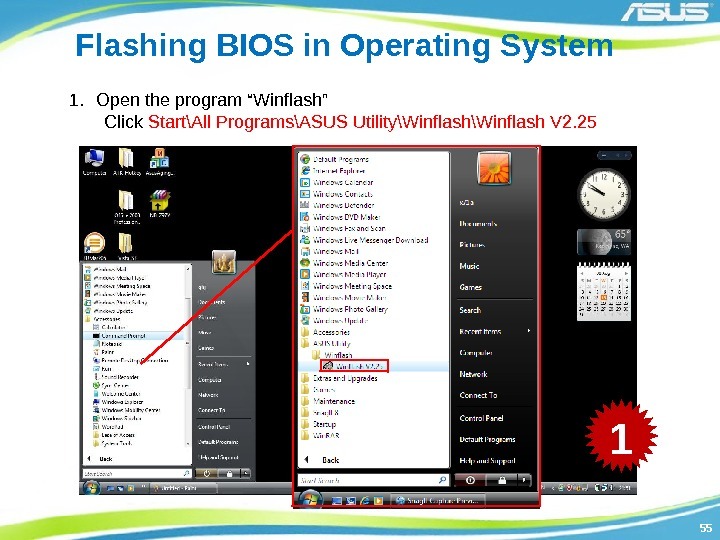 Win flash in Operating System 2. 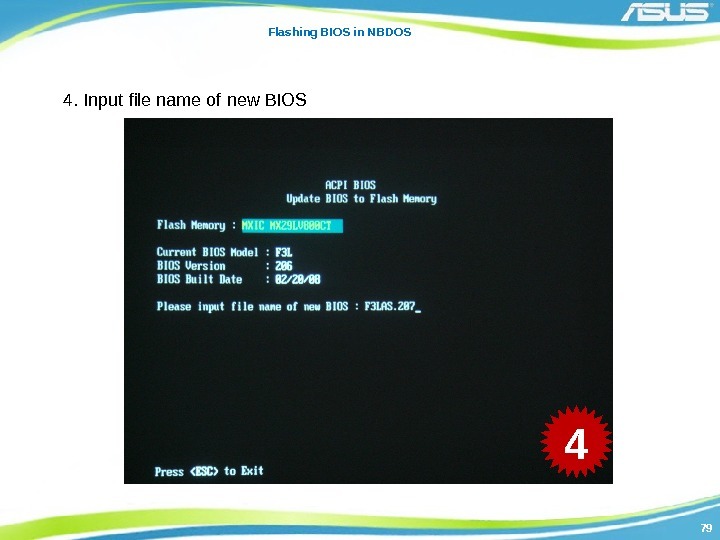 A flash in NBDOS 3. 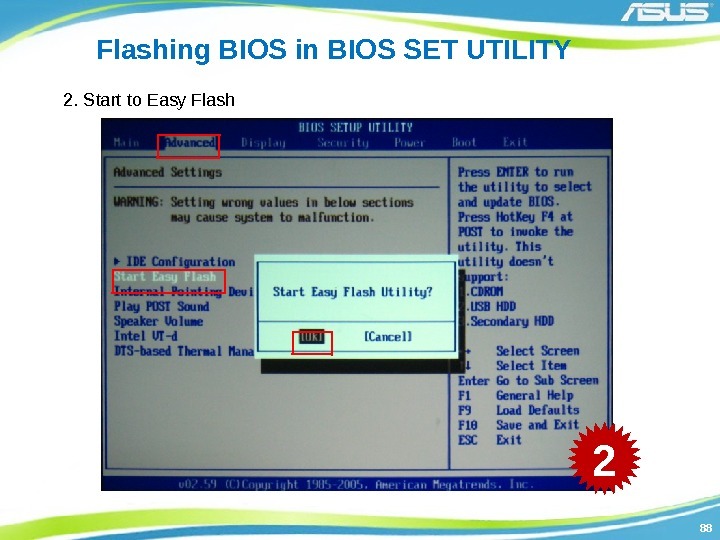 Easy Flash in BIOS SETUP UTILITY Hardware: 4. 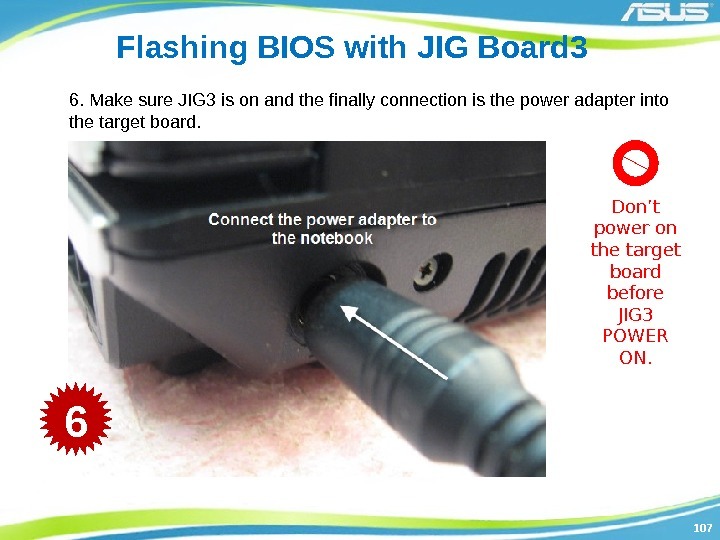 Jig Board 3 Warning: Careless updating can result in your Notebook PC having more proble ms.
5252 Preparation Before starting flashing BIOS, please plug in the ada pter so as to avoid the power off in the flashing process, which will lead to the BIOS flashing failure. 5454 Precondition Two preconditions mentioned before starting to update the BIOS in OS: 1. 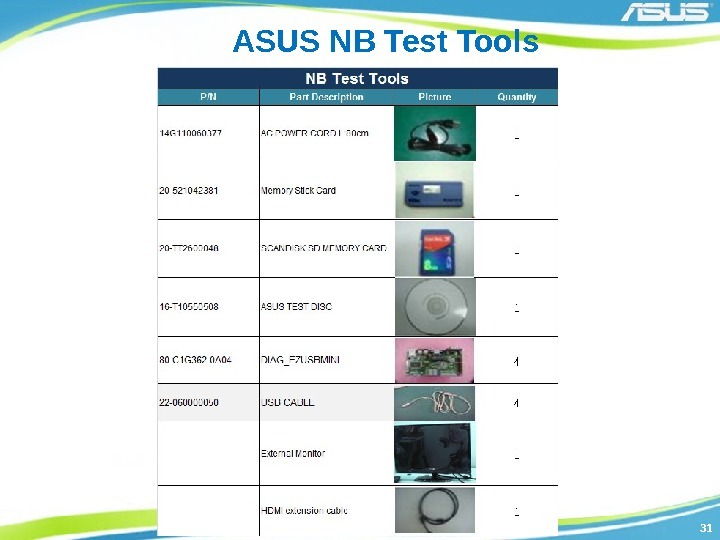 Download the exact BIOS files from the ASUS website • Before starting updating BIOS in OS, please verify the NB model then download the corresponded BIOS files from the ASUS website. 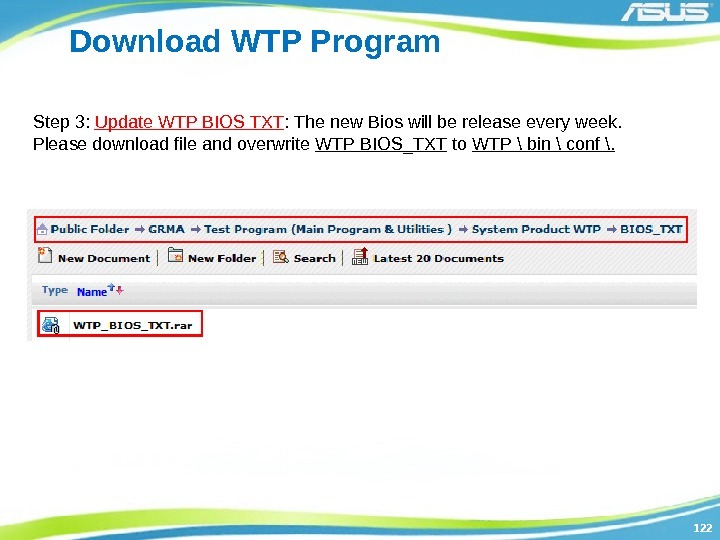 • The BIOS file can be found in the website as below: http: //www. 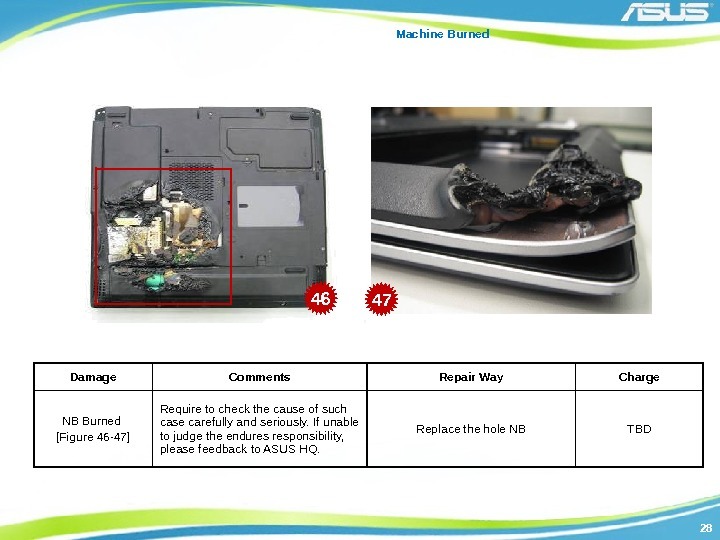 asus. com 2. 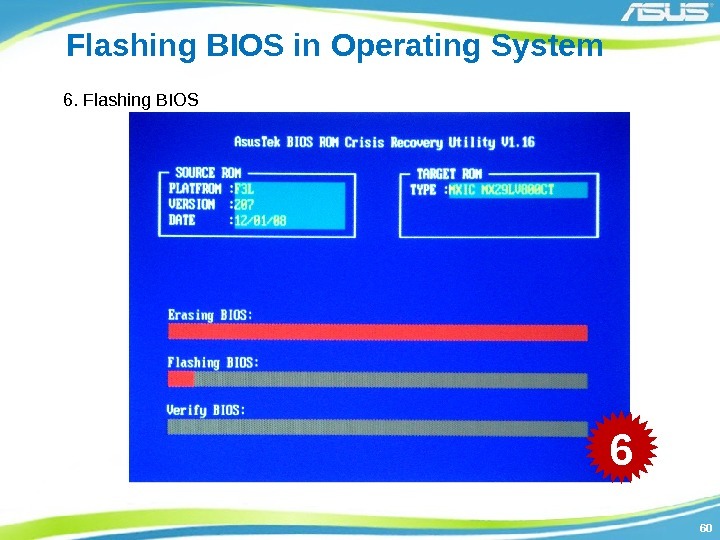 Please ensure the updating program ‘Winflash Utility’ has been installed in your NB before you start BIOS updating. 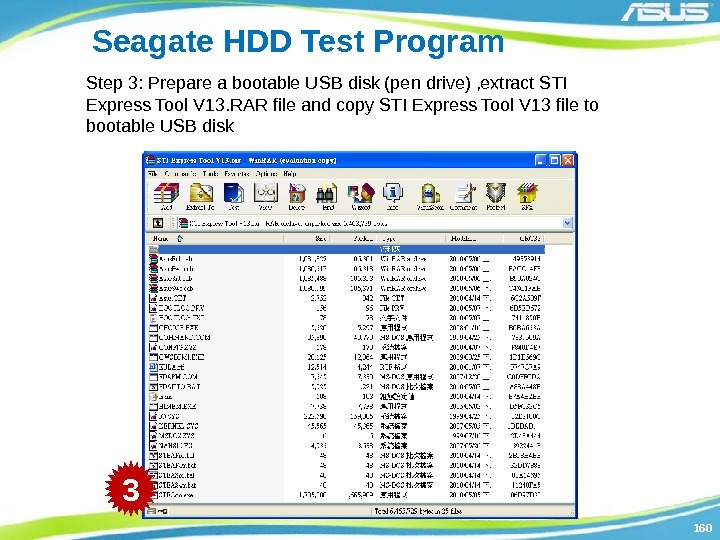 The program can be installed from the Driver & Utility CD. 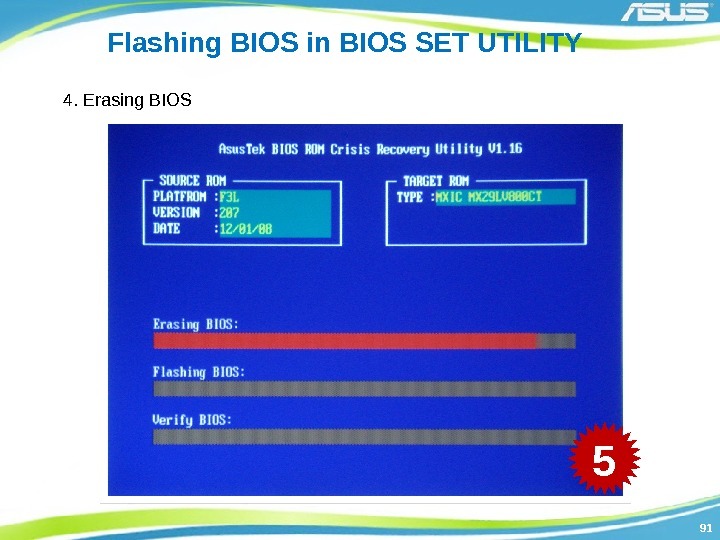 5555 Flashing BIOS in Operating System 1. 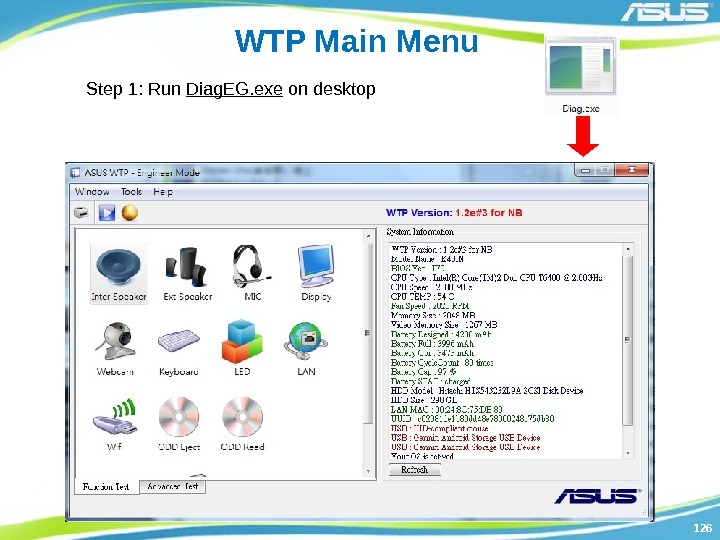 Open the program “Winflash” Click Start\All Programs\ASUS Utility\Winflash V 2. 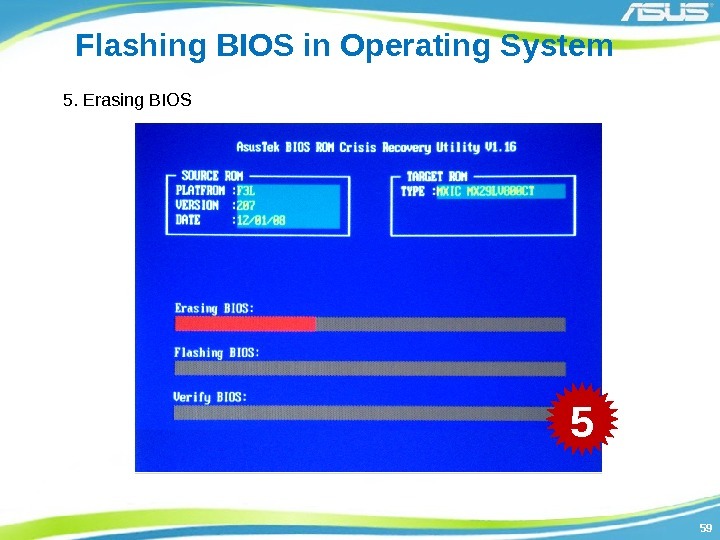 5656 Flashing BIOS in Operating System 2. 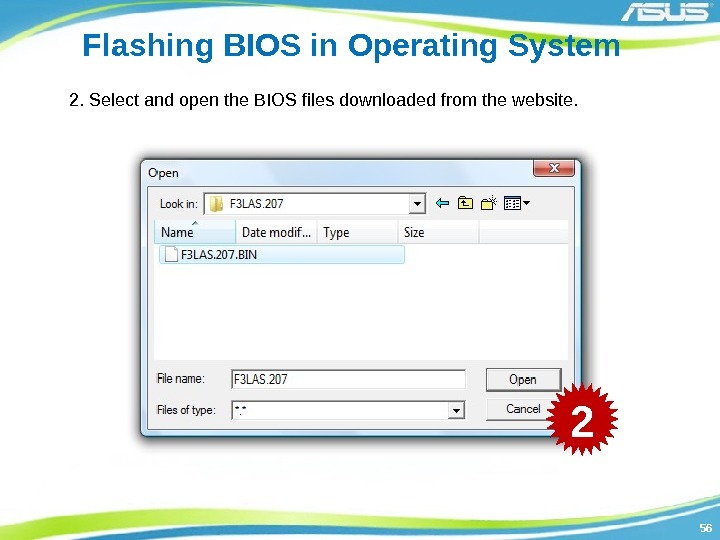 Select and open the BIOS files downloaded from the website. 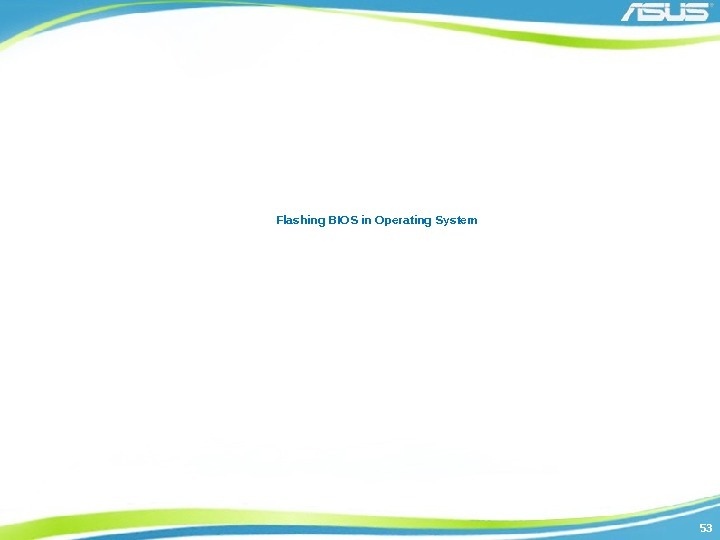 5757 Flashing BIOS in Operating System 3. 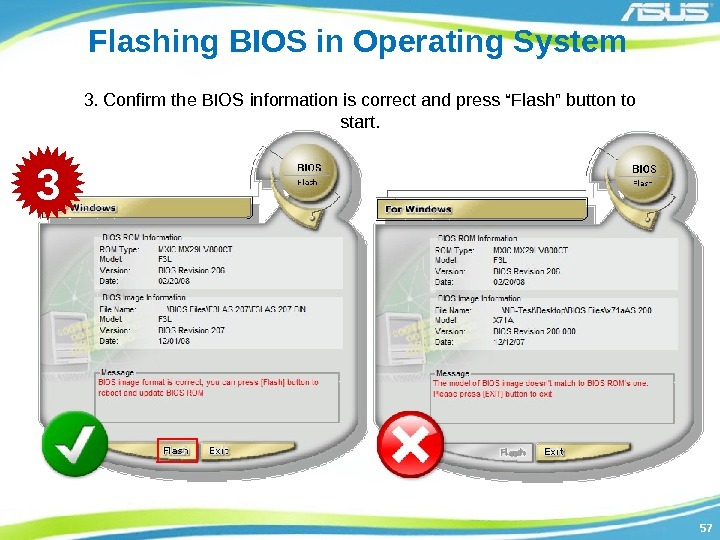 Confirm the BIOS information is correct and press “Flash” button to start. 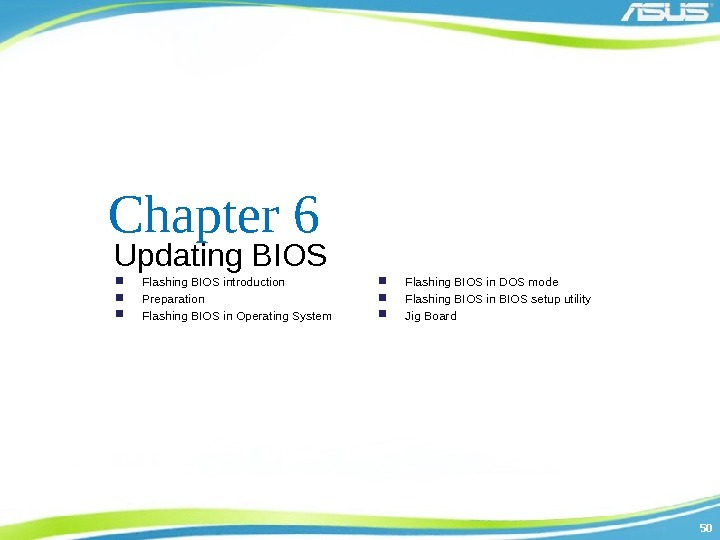 5858 Flashing BIOS in Operating System 4. 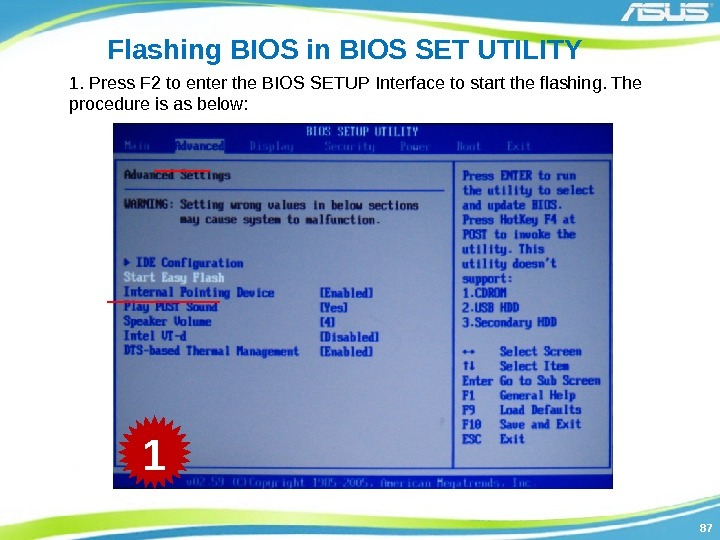 The system would shut down automatically and reboot again to enter the easy flash interface to start flashing the BIOS. 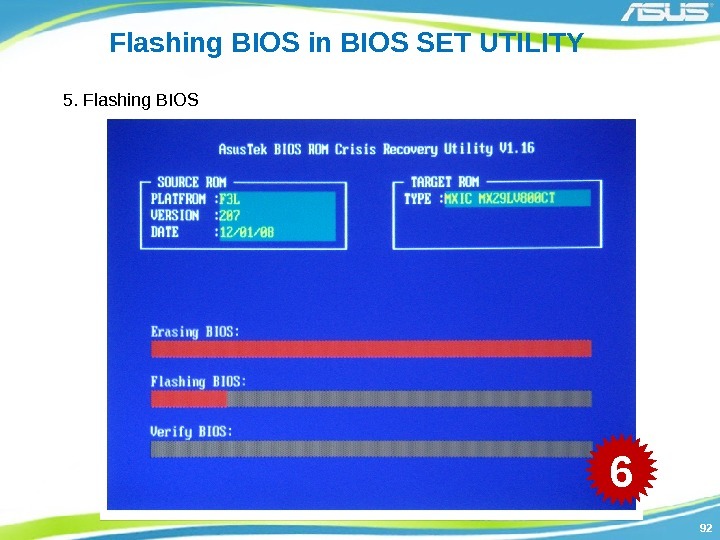 6161 Flashing BIOS in Operating System 7. 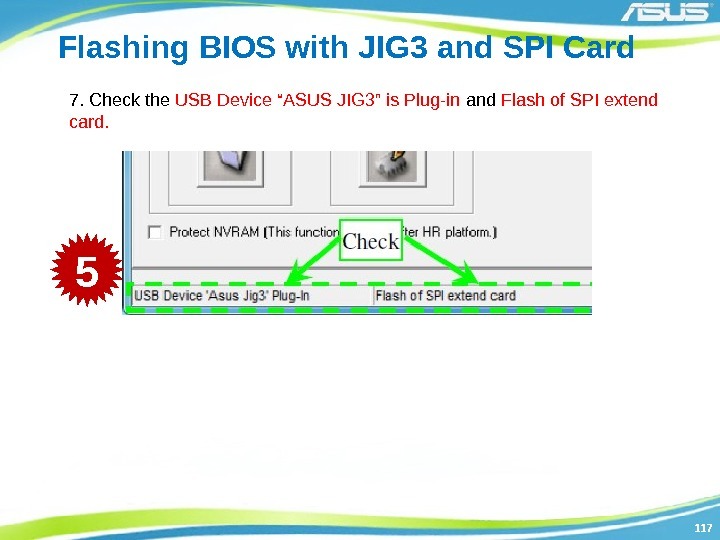 Verify BIOS. 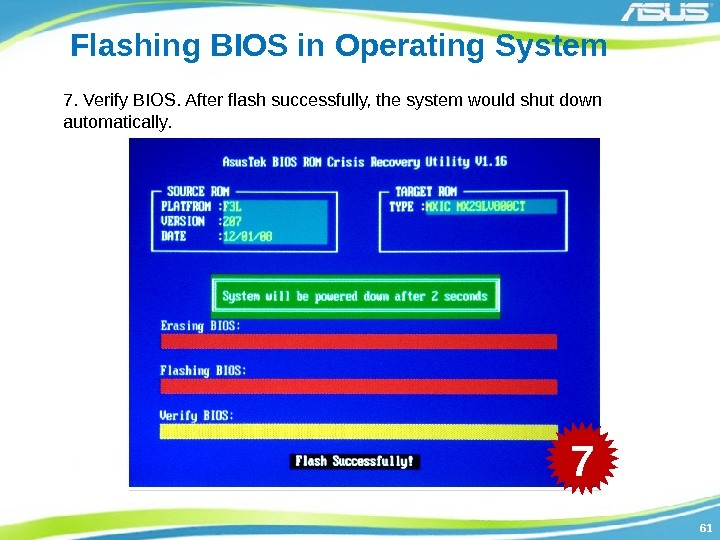 After flash successfully, the system would shut down automatically. 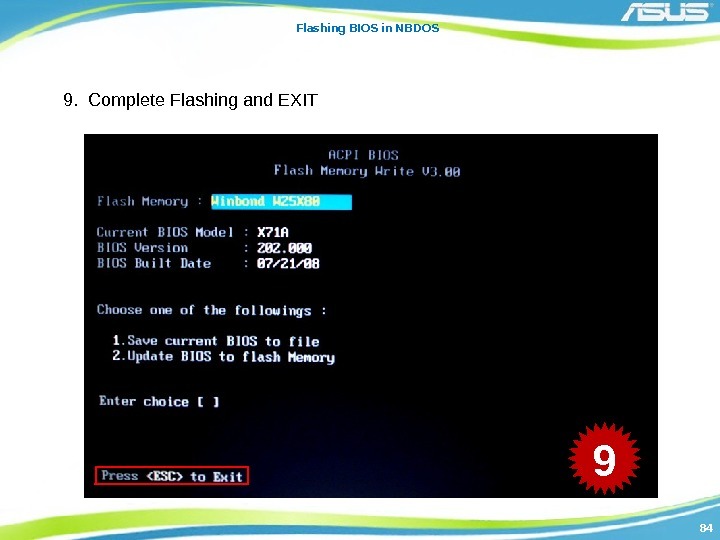 6262 Flashing BIOS in Operating System 8. Please restart and enter the BIOS setup interface to Load User Defaults. 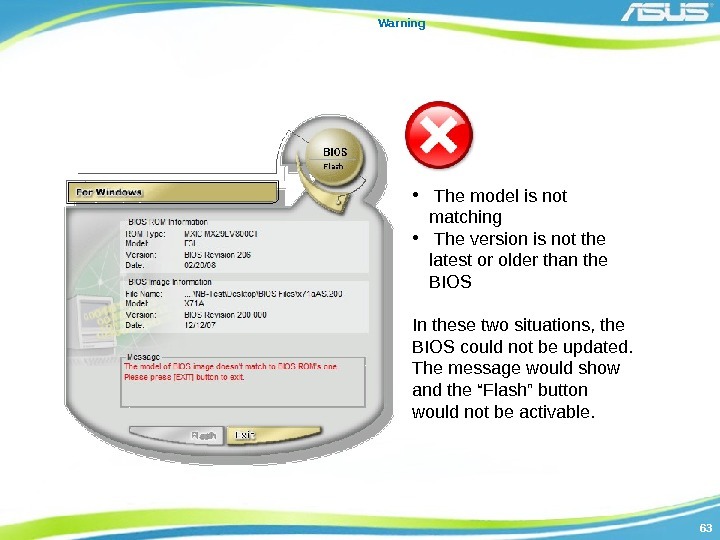 6363 Warning • The model is not matching • The version is not the latest or older than the BIOS In these two situations, the BIOS could not be updated. The message would show and the “Flash” button would not be activable. 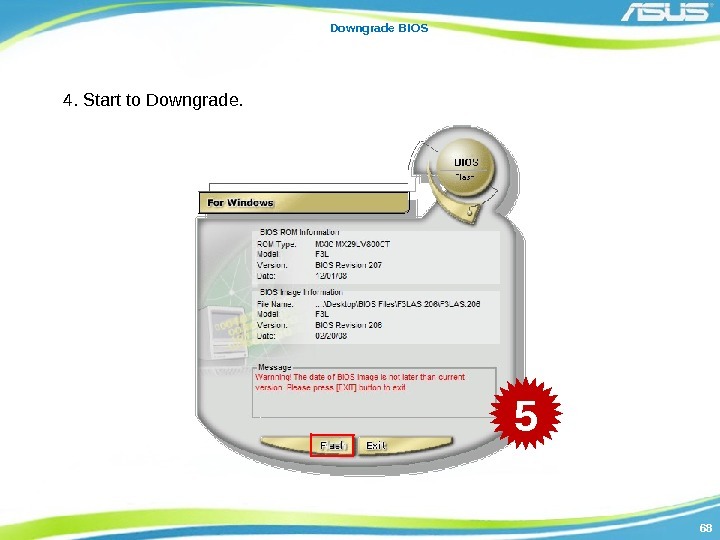 6464 Downgrade BIOS Description: With the new version of the BIOS, some functions would be disabled. 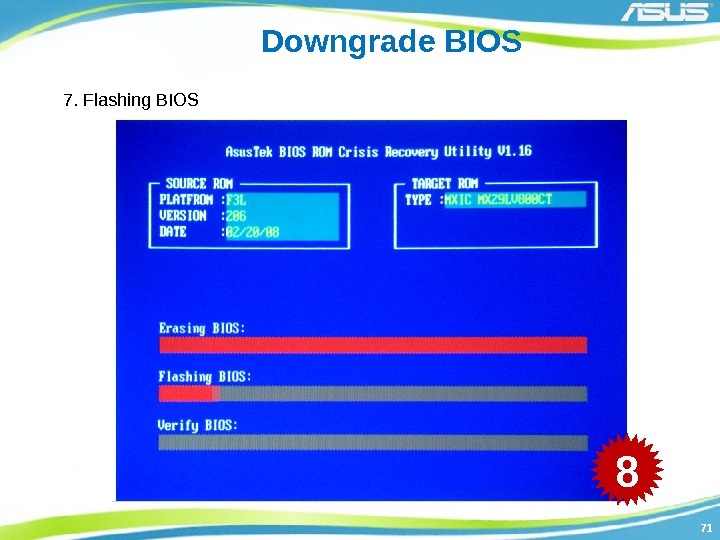 In this case, downgrade BIOS would be adapted. 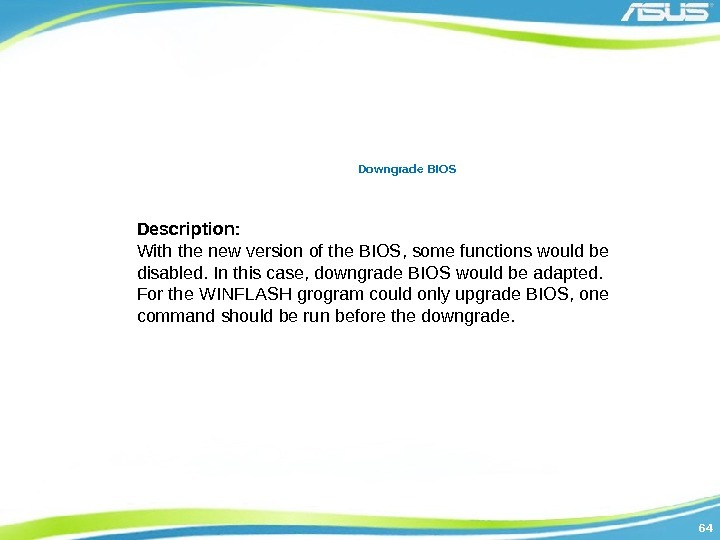 For the WINFLASH grogram could only upgrade BIOS, one command should be run before the downgrade. 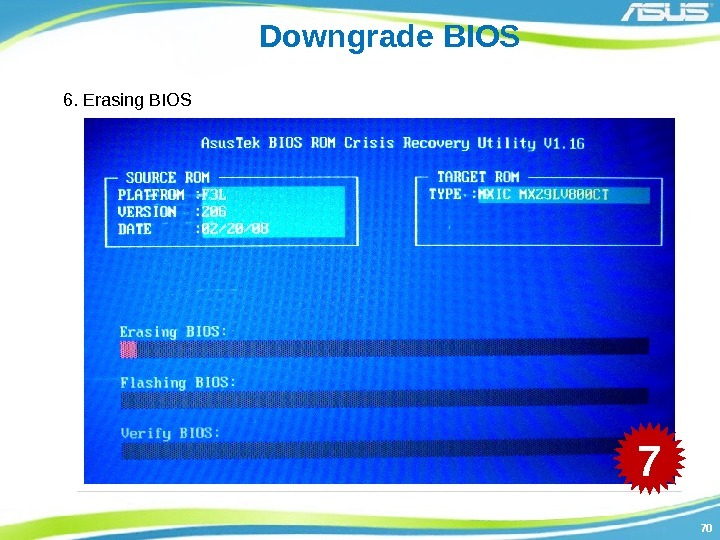 6767 Downgrade BIOS 3. 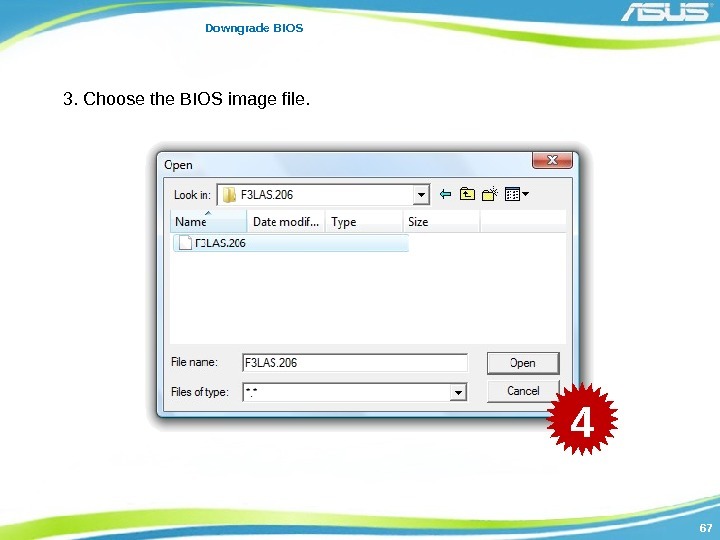 Choose the BIOS image file. 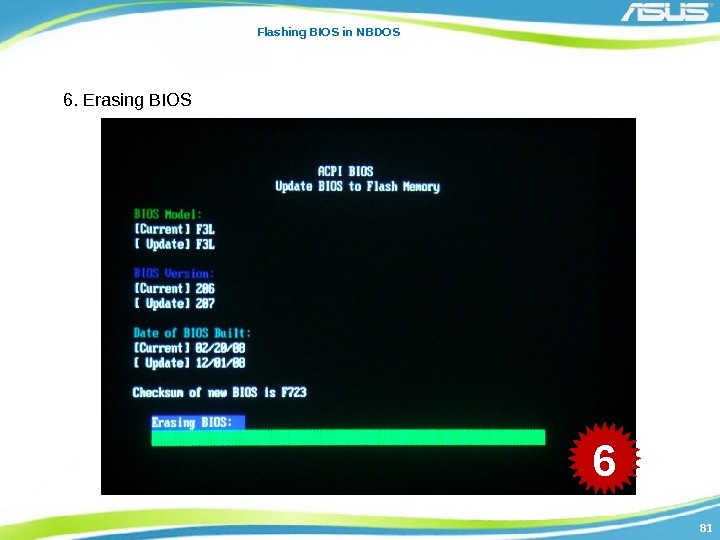 6868 Downgrade BIOS 4. Start to Downgrade. 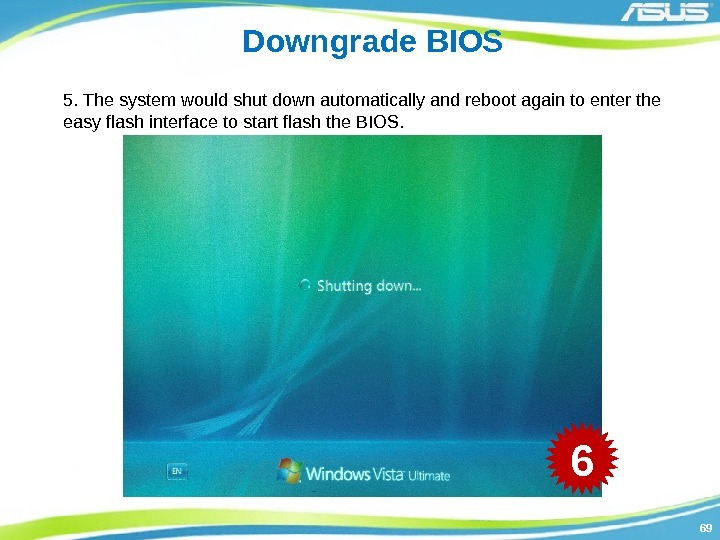 6969 Downgrade BIOS 5. 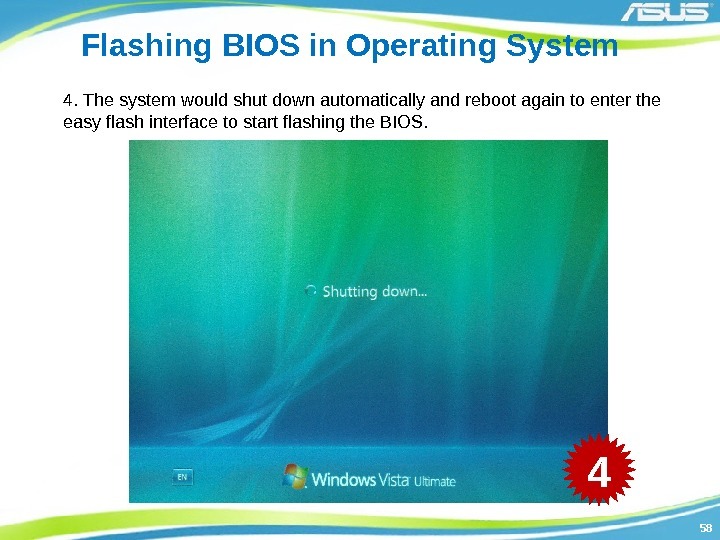 The system would shut down automatically and reboot again to enter the easy flash interface to start flash the BIOS. 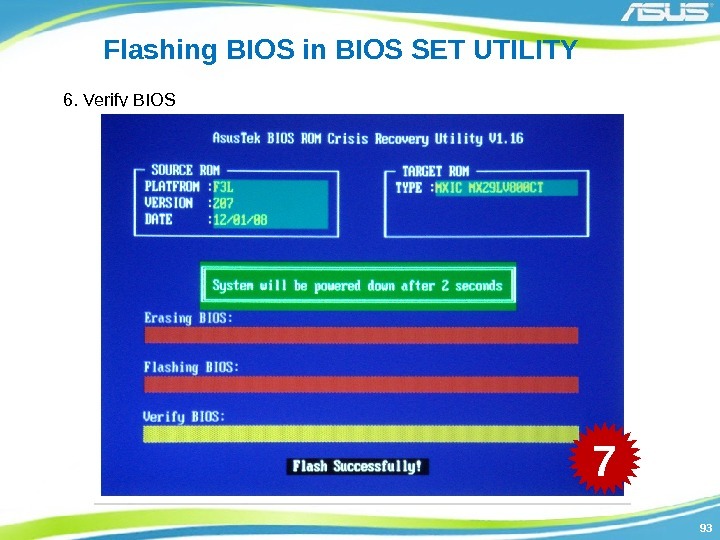 7272 Downgrade BIOS 8. 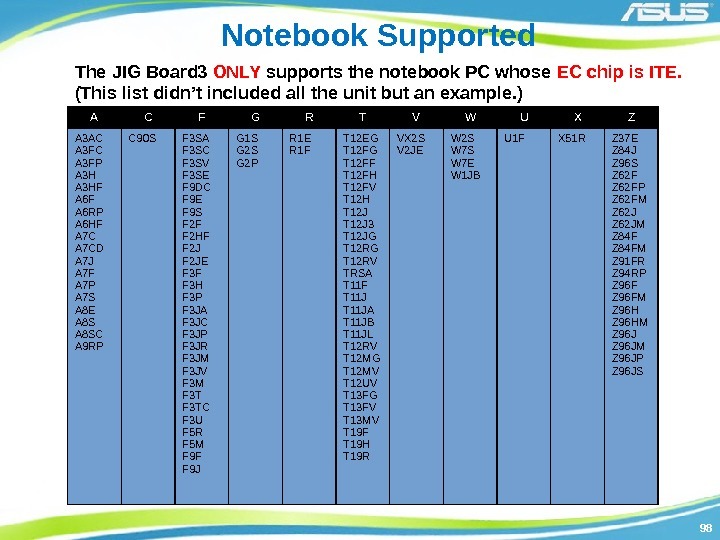 Verify BIOS. 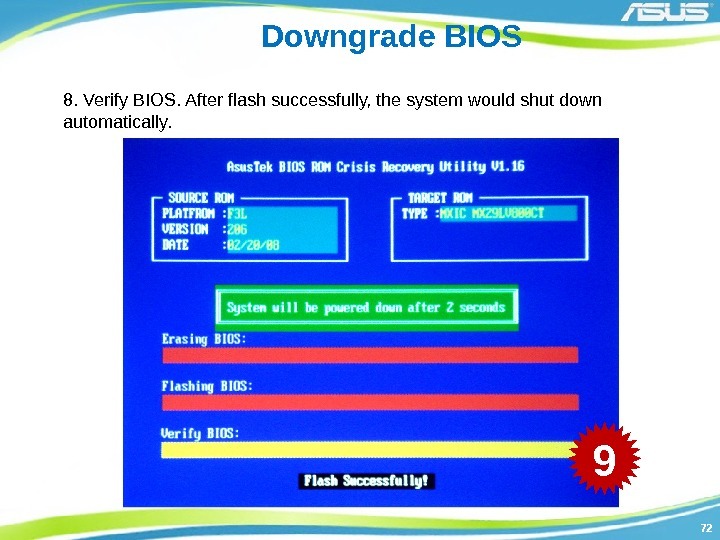 After flash successfully, the system would shut down automatically. 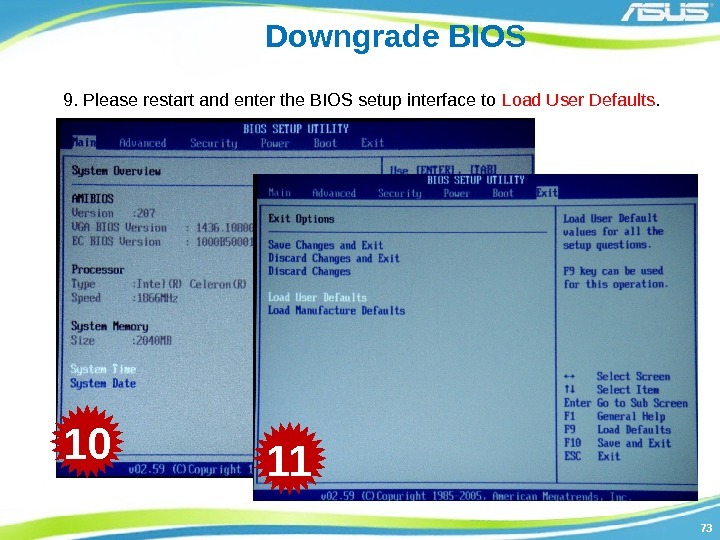 7373 Downgrade BIOS 9. Please restart and enter the BIOS setup interface to Load User Defaults. 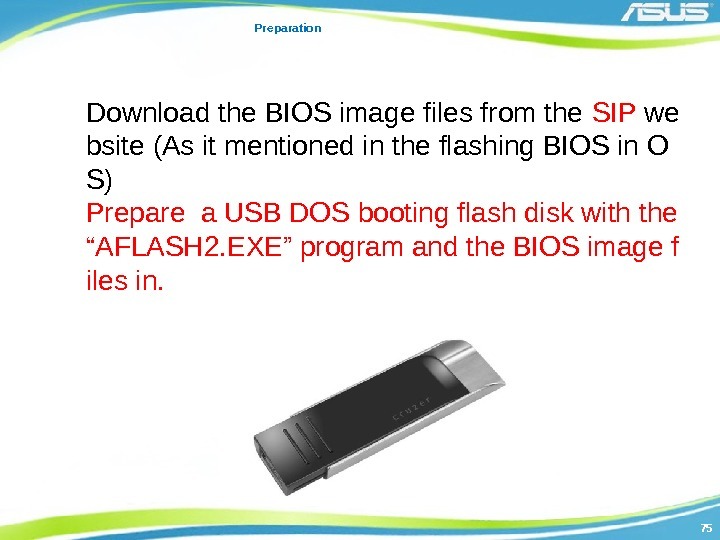 7575 Preparation Download the BIOS image files from the SIP we bsite (As it mentioned in the flashing BIOS in O S) Prepare a USB DOS booting flash disk with the “AFLASH 2. 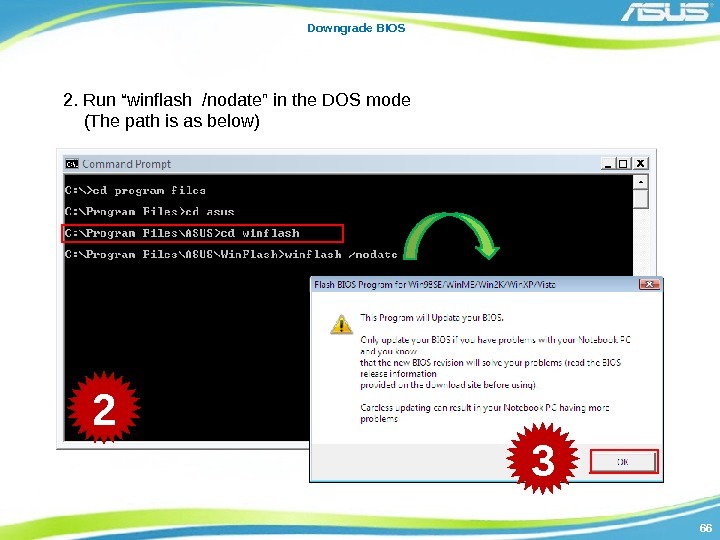 EXE” program and the BIOS image f iles in. 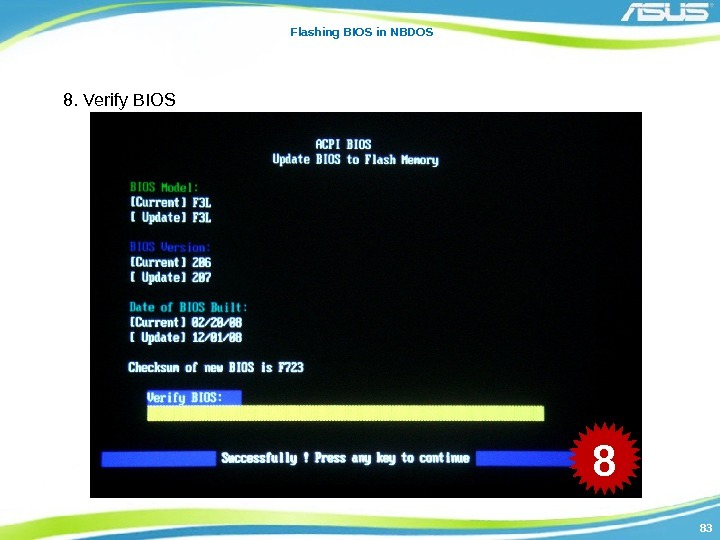 8080 Flashing BIOS in NBDOS 5. 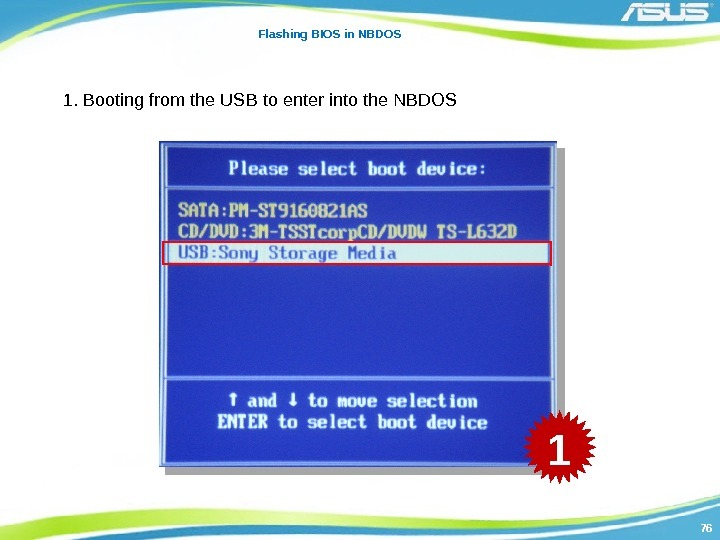 Confirm the new BIOS name and make sure to start flashing In this stage, please carefully check the model and version is correct then enter “Y” to continue, otherwise the system will flash a wrong BIOS which will cause the problem of no boot. 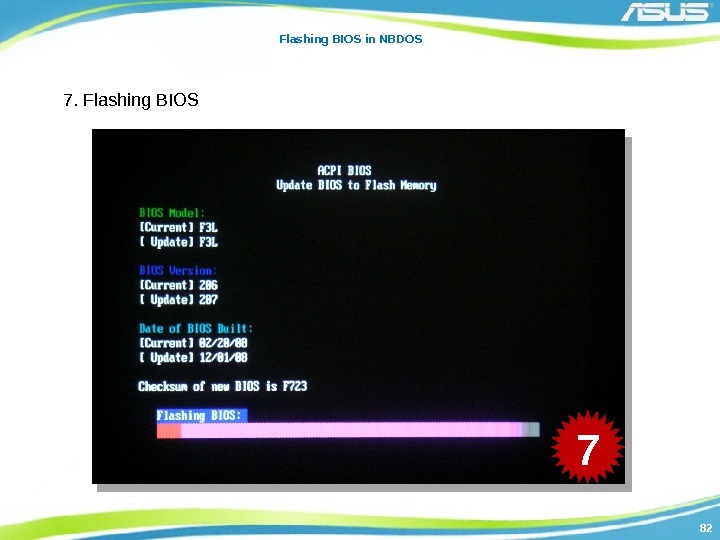 8585 Flashing BIOS in NBDOS 10. 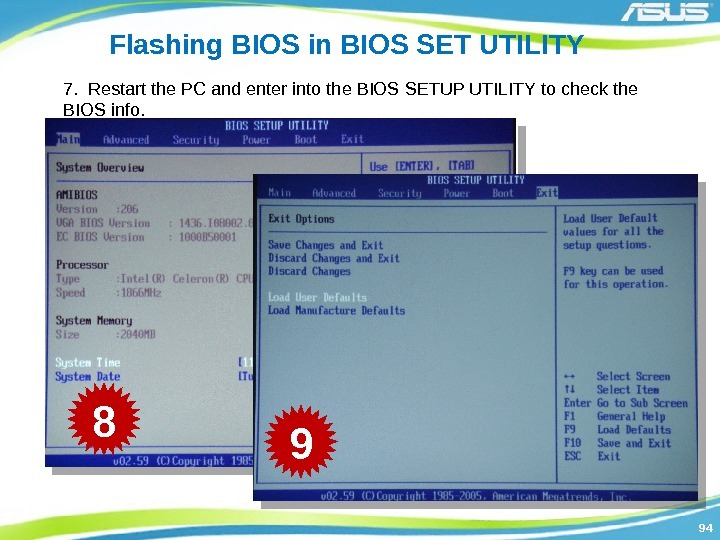 Restart the PC and enter into the BIOS SETUP UTILITY to check the BIOS info. 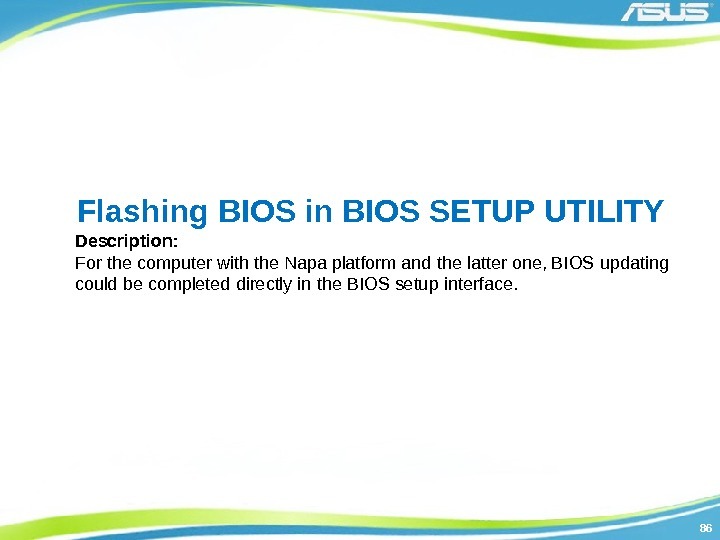 8686 Flashing BIOS in BIOS SETUP UTILITY Description: For the computer with the Napa platform and the latter one, BIOS updating could be completed directly in the BIOS setup interface. 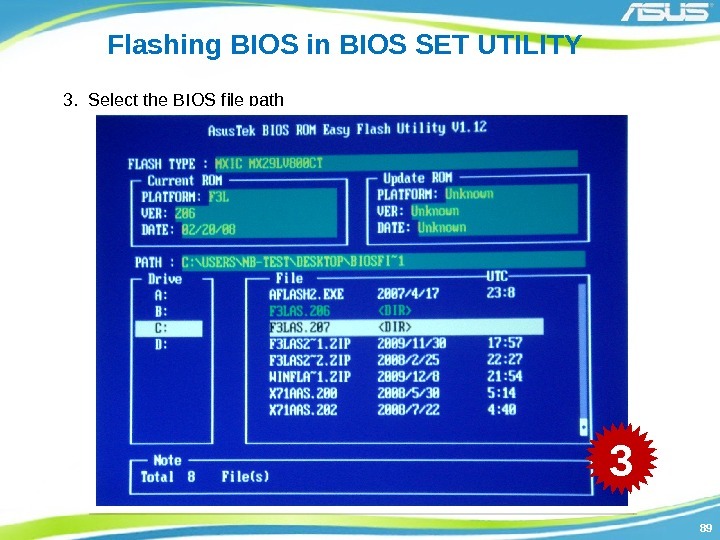 9494 Flashing BIOS in BIOS SET UTILITY 7. 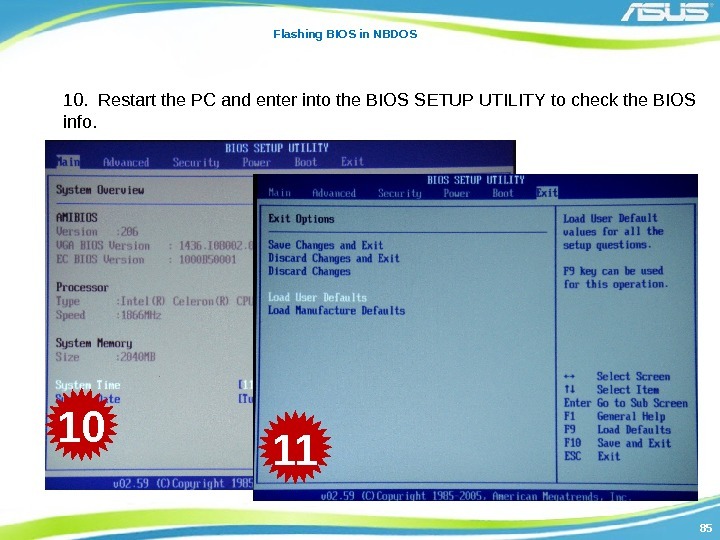 Restart the PC and enter into the BIOS SETUP UTILITY to check the BIOS info. 9595 Flashing BIOS by Jig Board 3 Description: This is a tool for flashing BIOS. The other three ways introduced before is for the software. 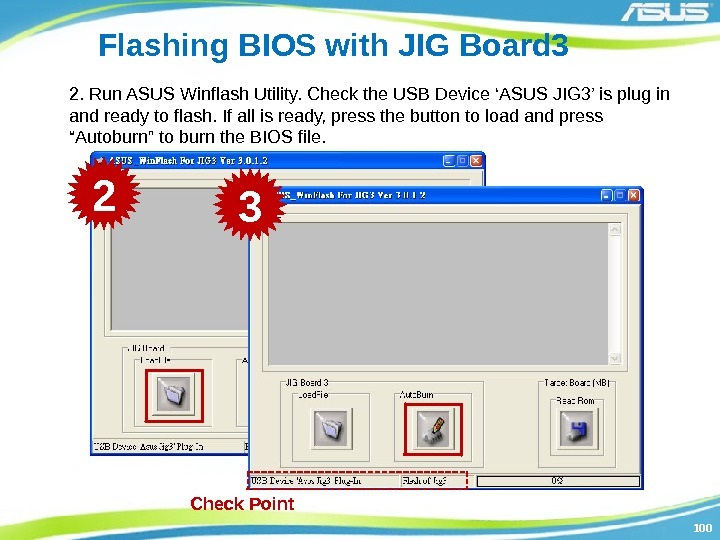 In the case of failure flashing BIOS by software, which would cause no boot, the BIOS could be flashed by another tool – JIG BOARD 3. 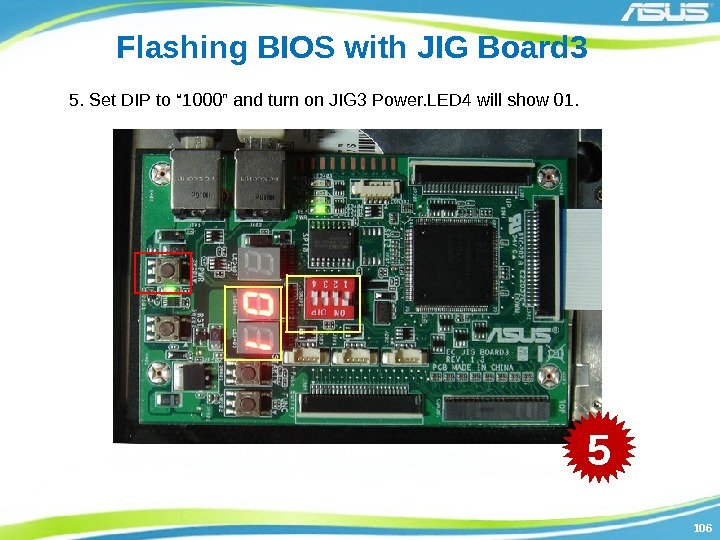 101101 Flashing BIOS with JIG Board 3 3. When the burning is done, press POWER button again to turn off the main power. 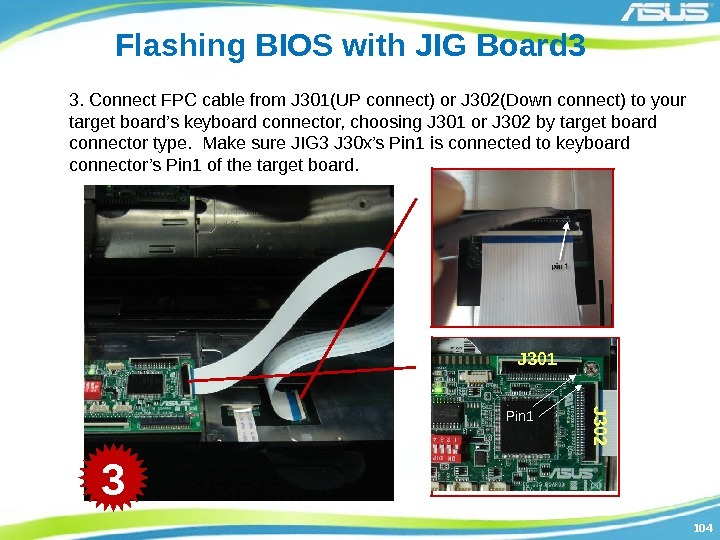 105105 Flashing BIOS with JIG Board 3 4. 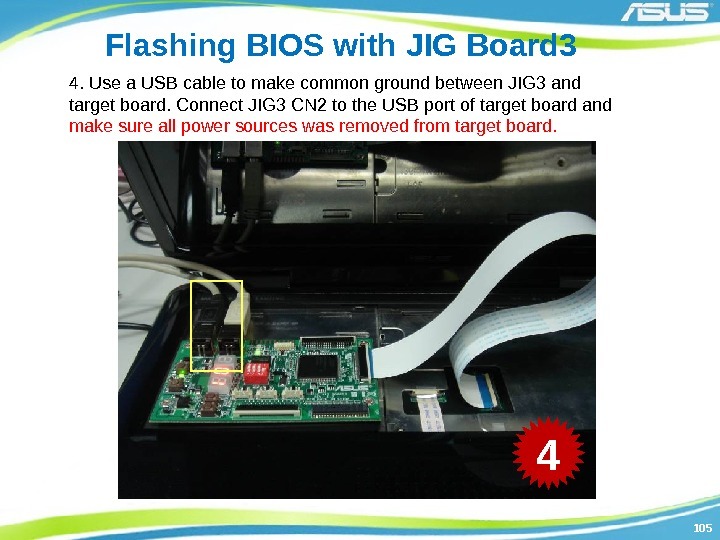 Use a USB cable to make common ground between JIG 3 and target board. 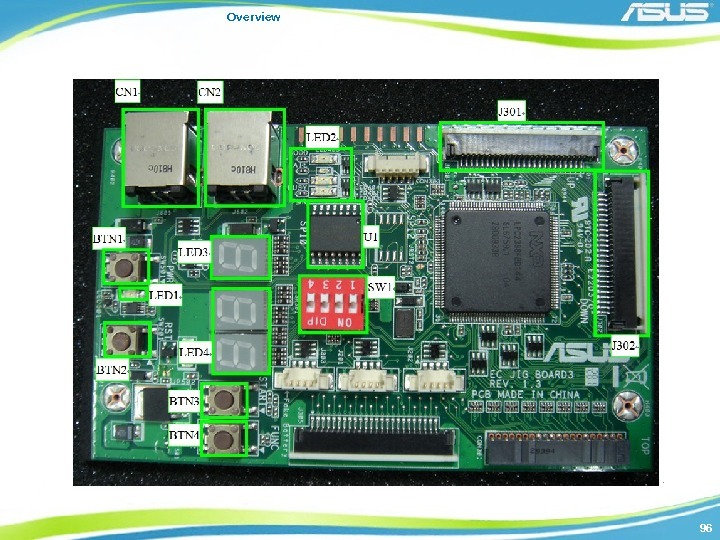 Connect JIG 3 CN 2 to the USB port of target board and make sure all power sources was removed from target board. 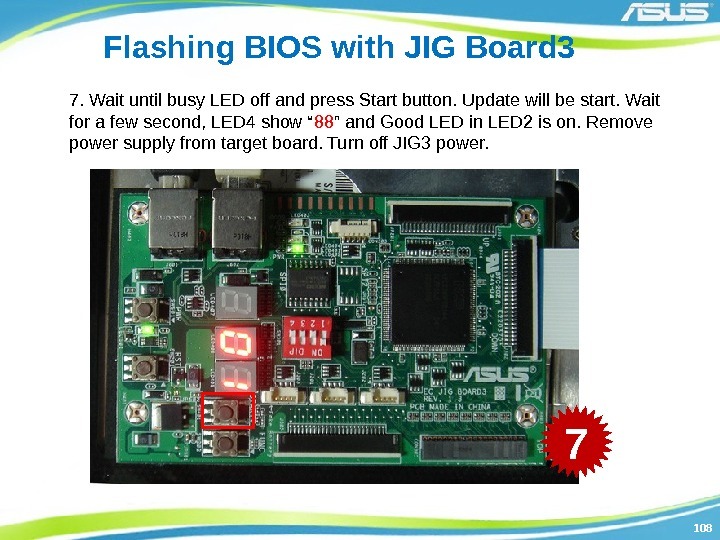 106106 Flashing BIOS with JIG Board 3 5. Set DIP to “ 1000” and turn on JIG 3 Power. LED 4 will show 01. 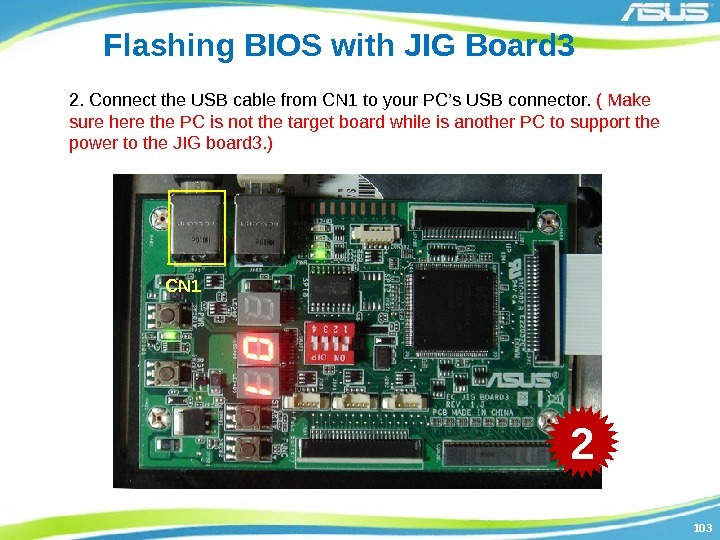 107107 Flashing BIOS with JIG Board 3 6. Make sure JIG 3 is on and the finally connection is the power adapter into the target board. 6 Don’t power on the target board before JIG 3 POWER ON. 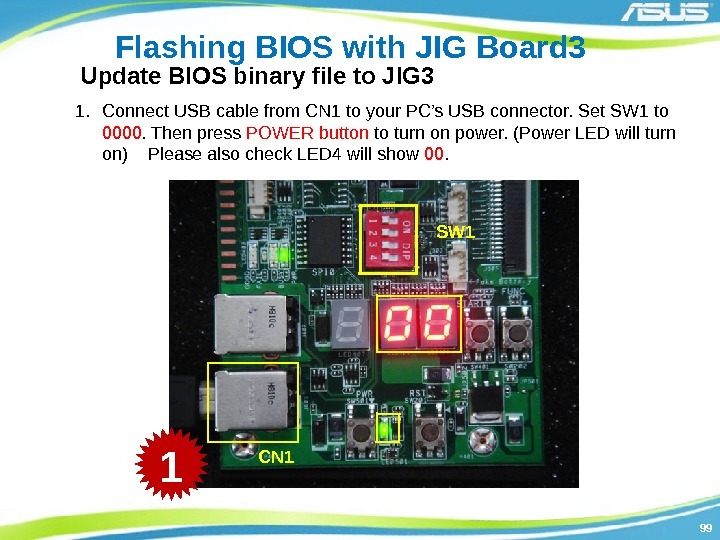 108108 Flashing BIOS with JIG Board 3 7. Wait until busy LED off and press Start button. Update will be start. Wait for a few second, LED 4 show “ 88 ” and Good LED in LED 2 is on. Remove power supply from target board. Turn off JIG 3 power. 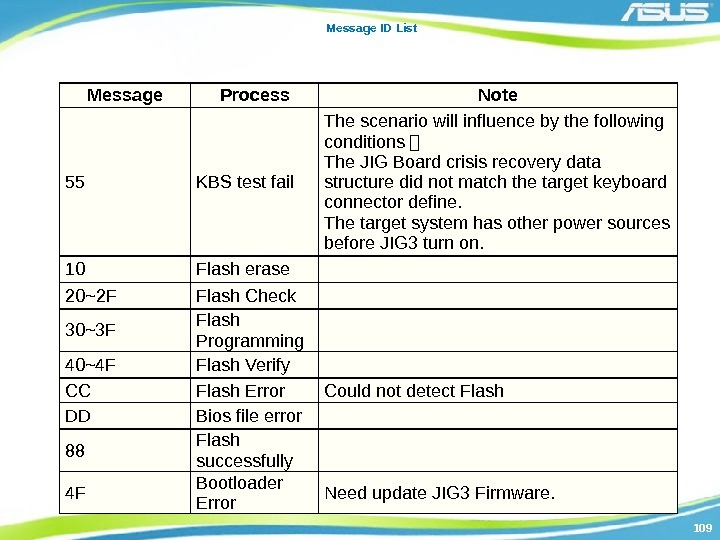 109109 Message ID List Message Process Note 55 KBS test fail The scenario will influence by the following conditions 鏡 The JIG Board crisis recovery data structure did not match the target keyboard connector define. 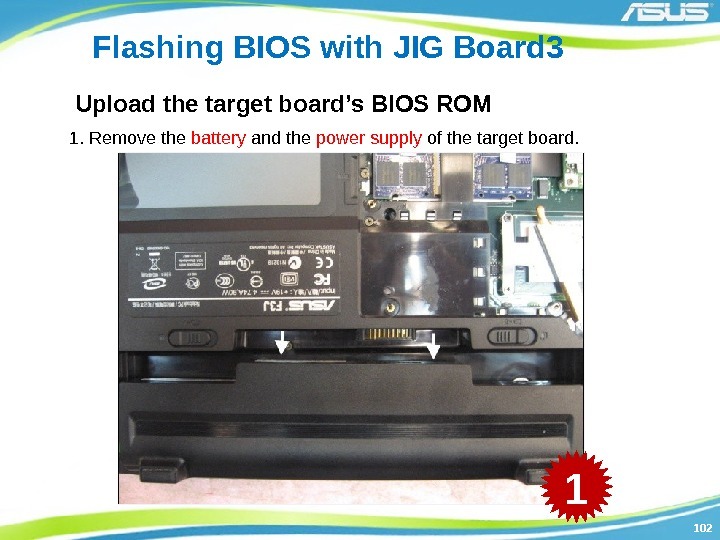 The target system has other power sources before JIG 3 turn on. 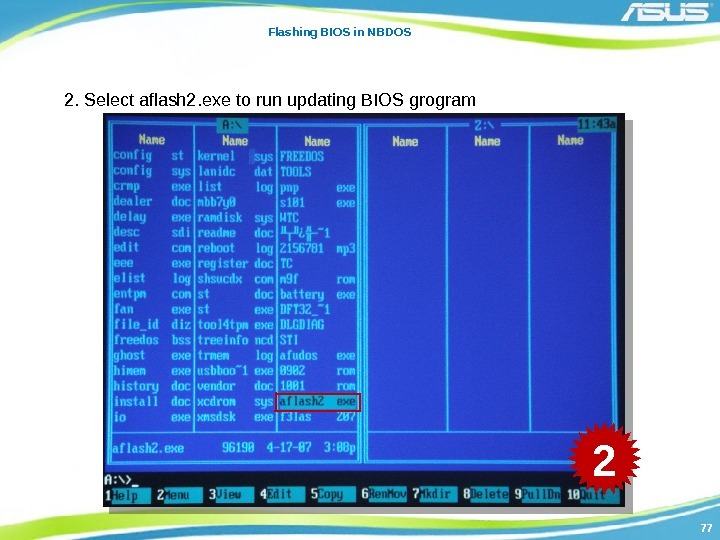 10 Flash erase 20~2 F Flash Check 30~3 F Flash Programming 40~4 F Flash Verify CC Flash Error Could not detect Flash DD Bios file error 88 Flash successfully 4 F Bootloader Error Need update JIG 3 Firmware. 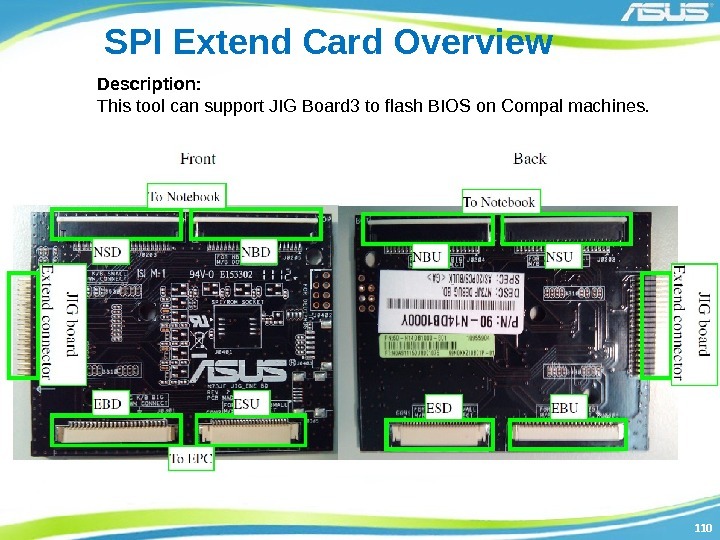 110110 SPI Extend Card Overview Description: This tool can support JIG Board 3 to flash BIOS on Compal machines. 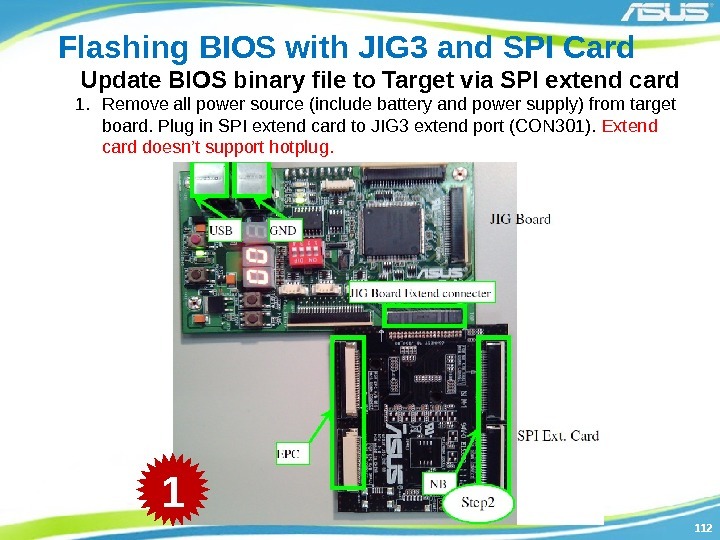 112112 Flashing BIOS with JIG 3 and SPI Card Update BIOS binary file to Target via SPI extend card 1. 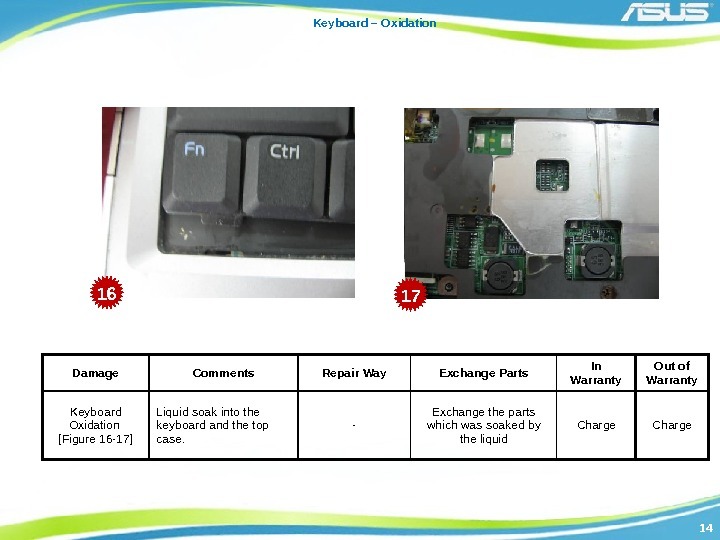 Remove all power source (include battery and power supply) from target board. 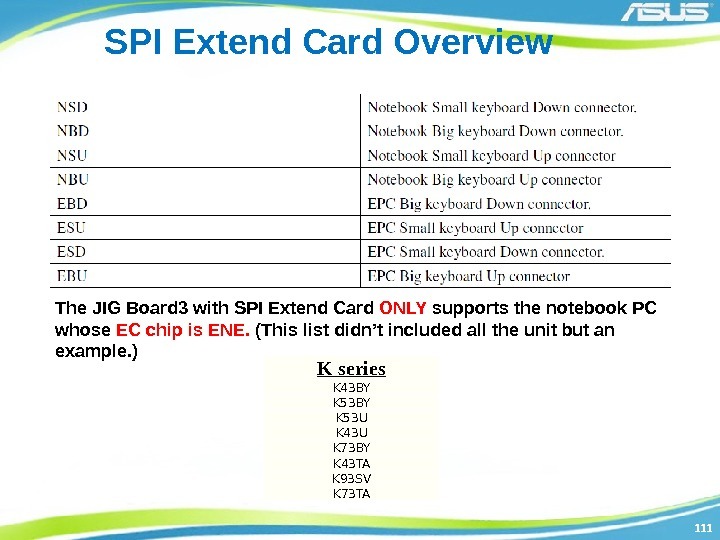 Plug in SPI extend card to JIG 3 extend port (CON 301). Extend card doesn’t support hotplug. 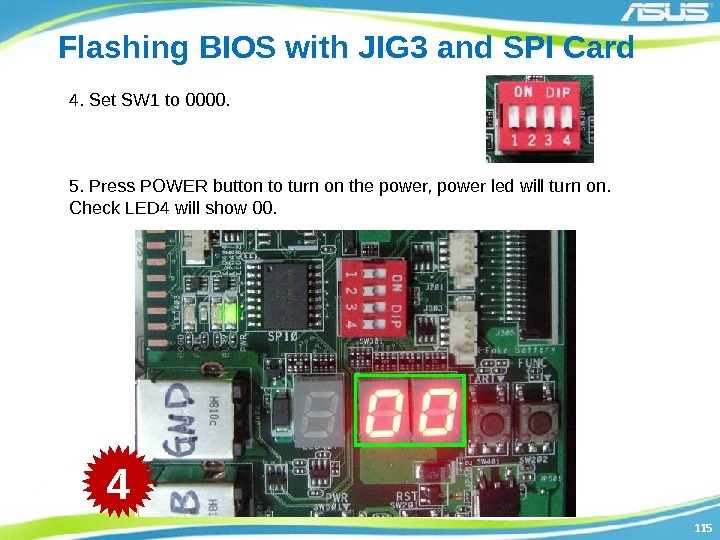 113113 Flashing BIOS with JIG 3 and SPI Card 2. 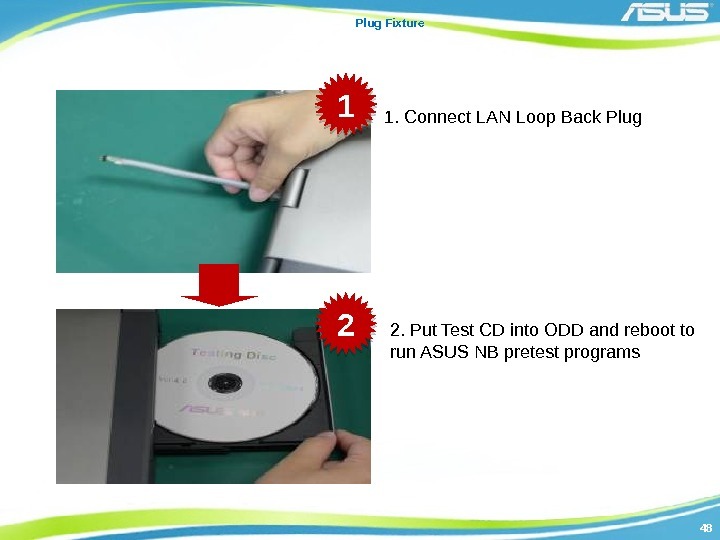 Connect the USB cable from CN 1 to your PC’s USB connector. 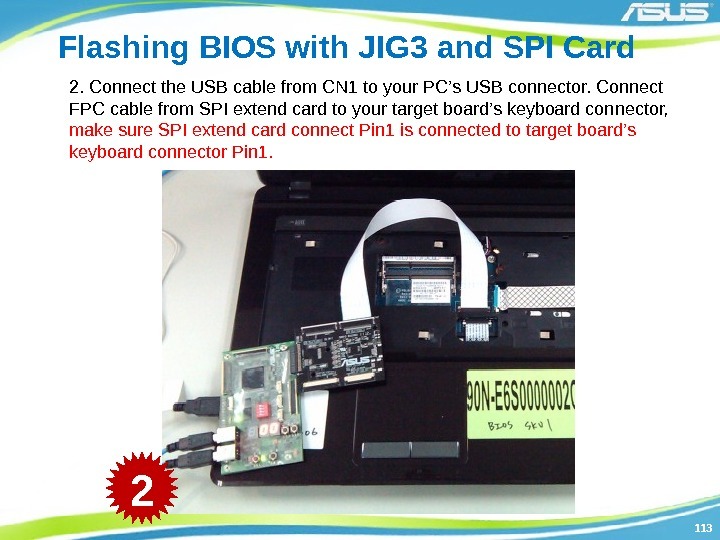 Connect FPC cable from SPI extend card to your target board’s keyboard connector, make sure SPI extend card connect Pin 1 is connected to target board’s keyboard connector Pin 1. 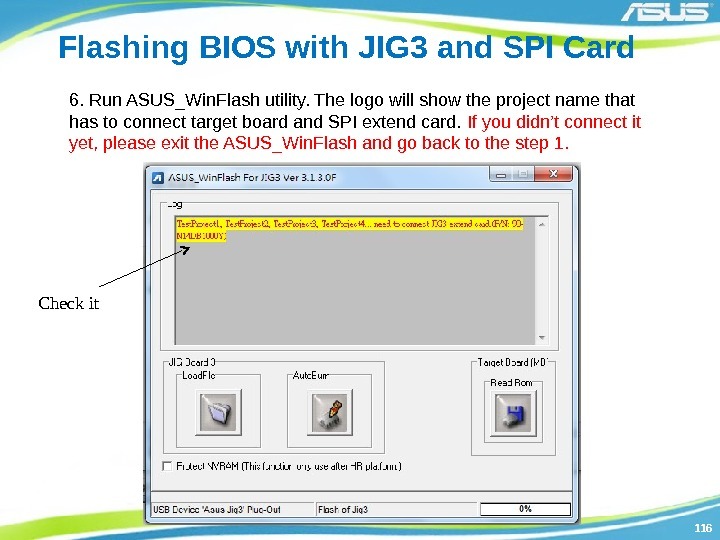 114114 Flashing BIOS with JIG 3 and SPI Card 3. 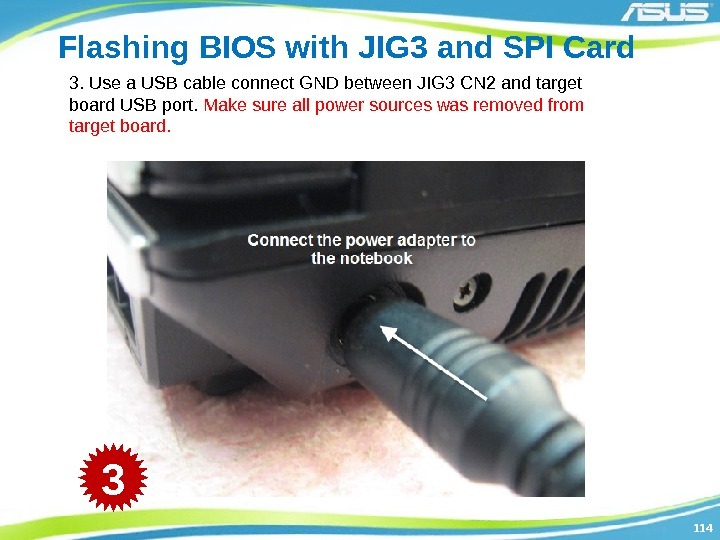 Use a USB cable connect GND between JIG 3 CN 2 and target board USB port. Make sure all power sources was removed from target board. 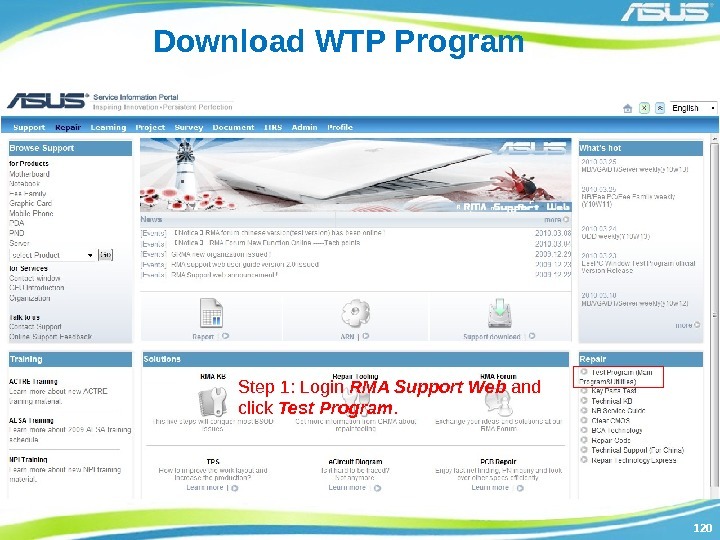 120120 Download WTP Program Step 1: Login RMA Support Web and click Test Program. 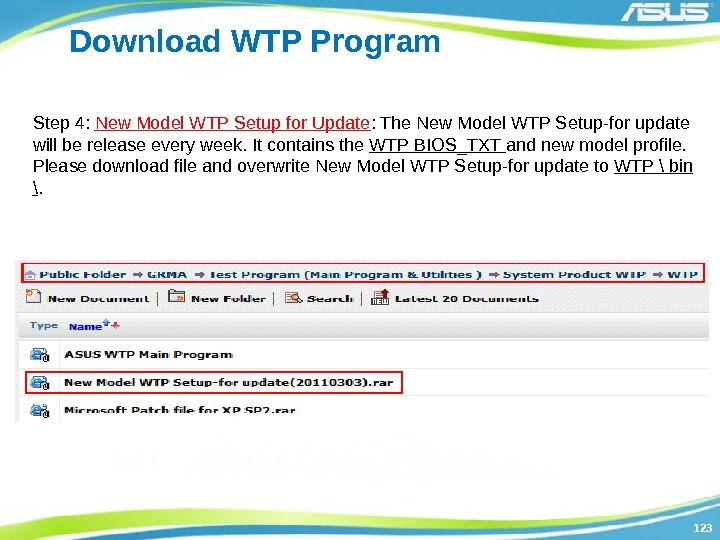 123123 Download WTP Program Step 4: New Model WTP Setup for Update : The New Model WTP Setup-for update will be release every week. 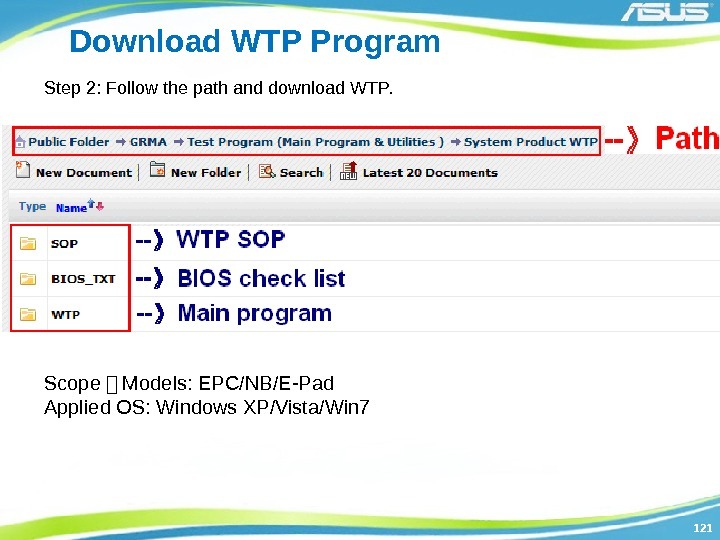 It contains the WTP BIOS_TXT and new model profile. 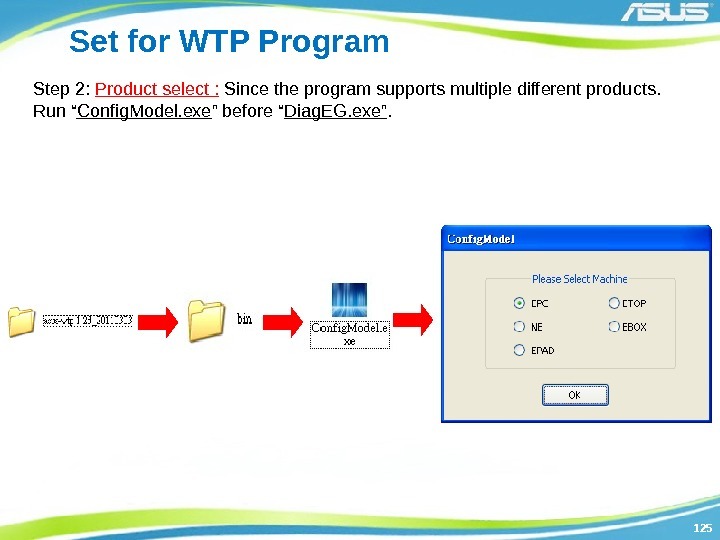 Please download file and overwrite New Model WTP Setup-for update to WTP \ bin \. 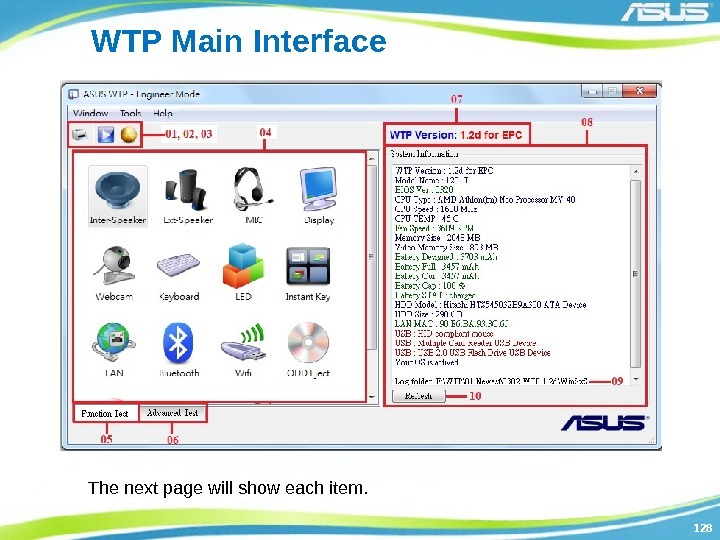 128128 WTP Main Interface The next page will show each item. 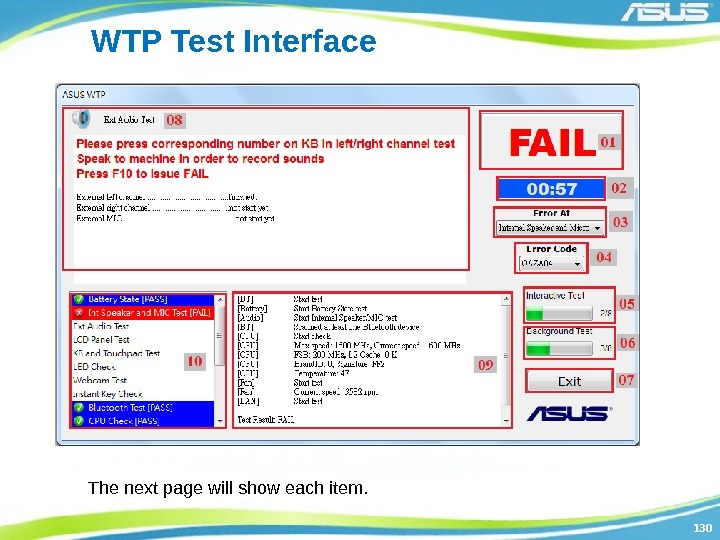 130130 WTP Test Interface The next page will show each item. 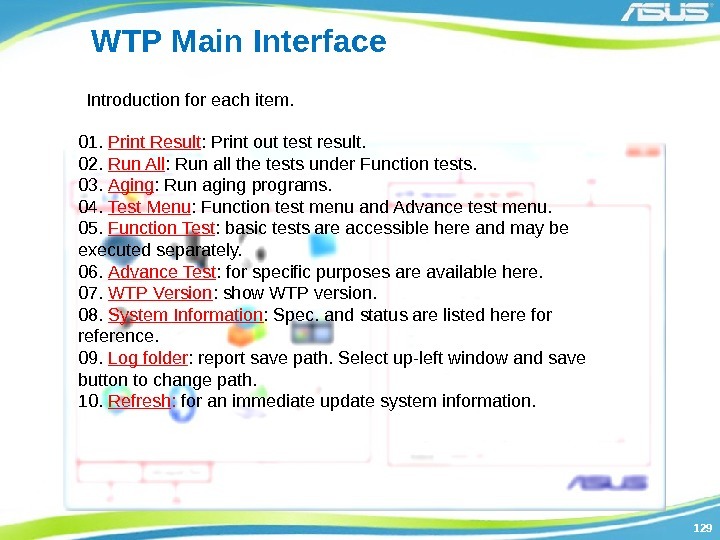 131131 WTP Test Interface 01. Test Result. 02. Test Time. 03. Error at where. 04. Error code. 05. 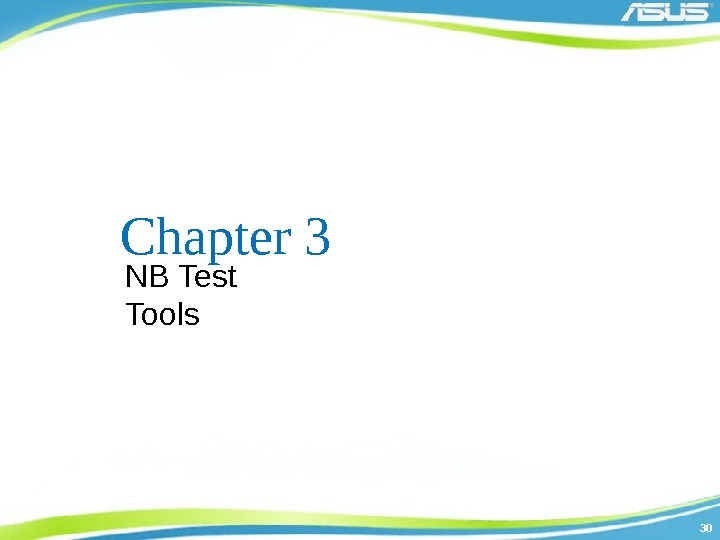 Interactive Test state. 06. Background Test state. 07. Exit test program. 08. Current running inter active test. 09. Test state. 10. Test results are listed here: a. 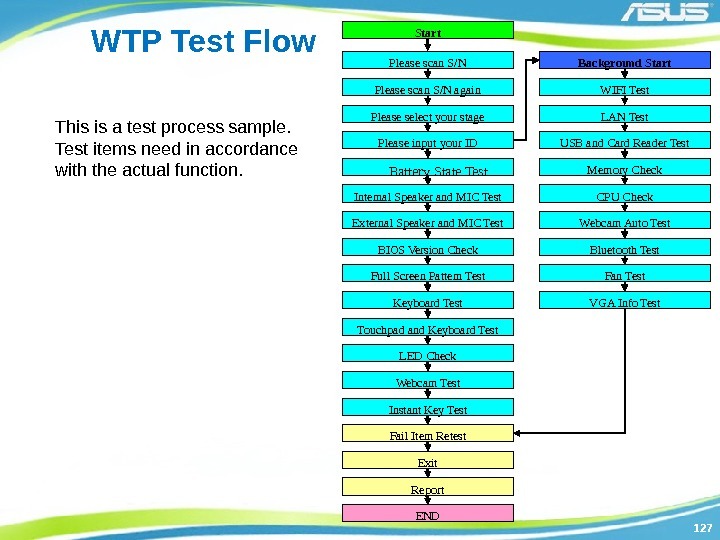 Function tests determined by program and executed in the background automatically. b. 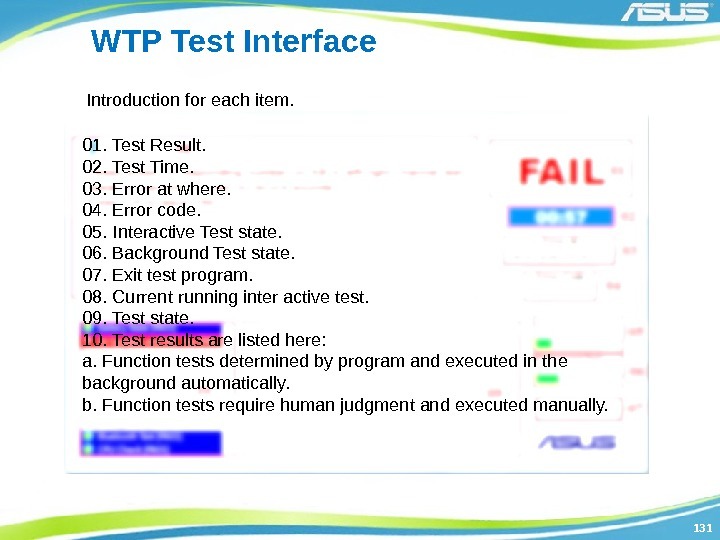 Function tests require human judgment and executed manually. Introduction for each item. 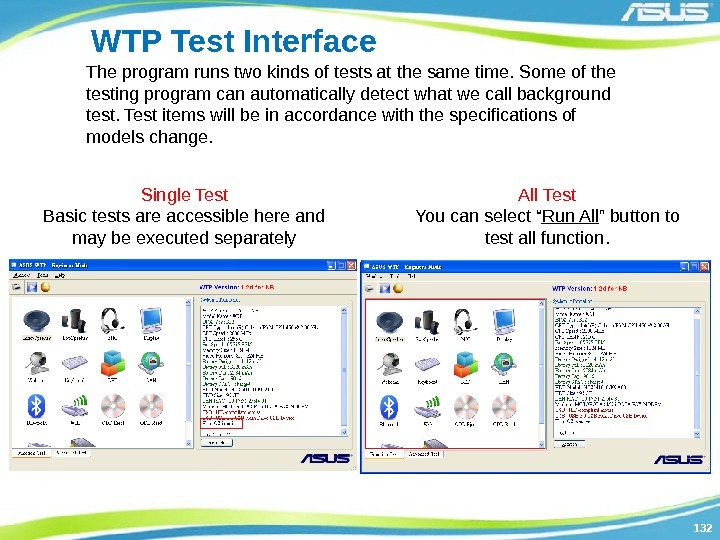 132132 WTP Test Interface The program runs two kinds of tests at the same time. 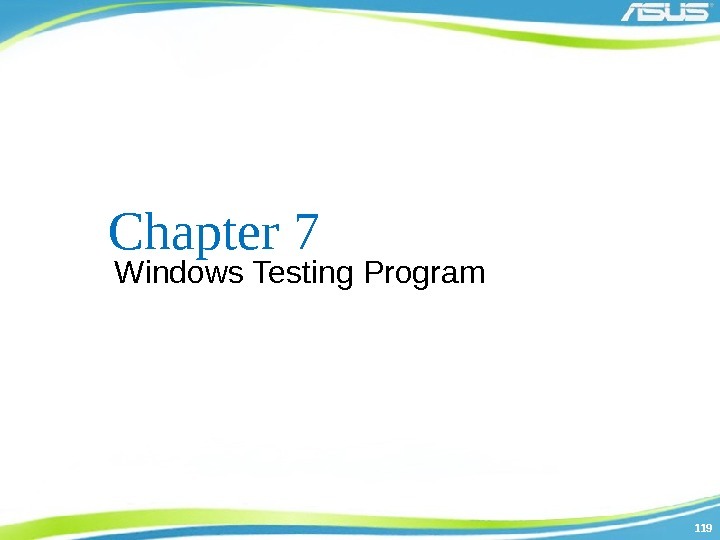 Some of the testing program can automatically detect what we call background test. 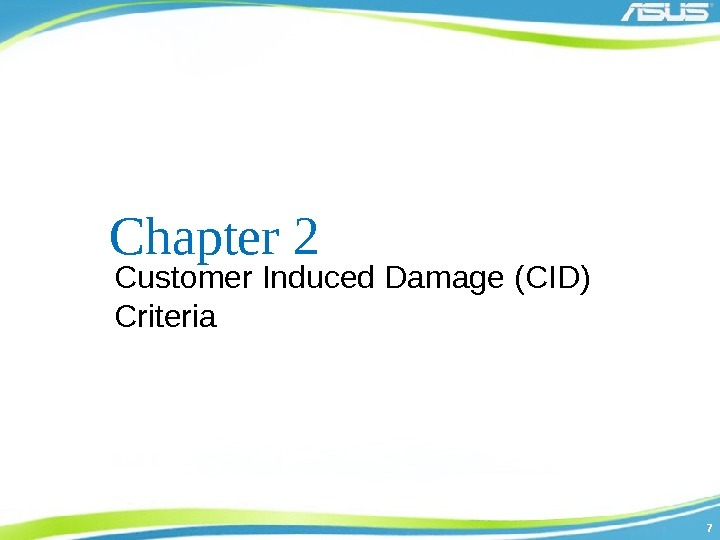 Test items will be in accordance with the specifications of models change. Single Test Basic tests are accessible here and may be executed separately All Test You can select “ Run All ” button to test all function. 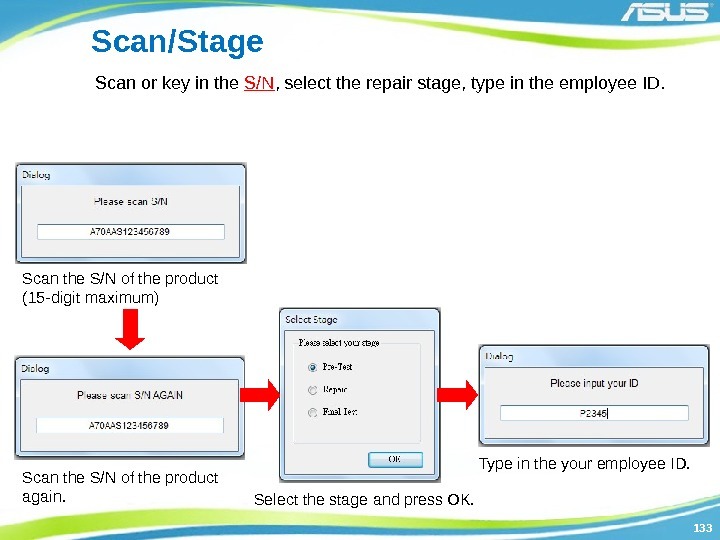 133133 Scan/Stage Scan or key in the S/N , select the repair stage, type in the employee ID. Scan the S/N of the product (15 -digit maximum) Scan the S/N of the product again. Select the stage and press OK. Type in the your employee ID. 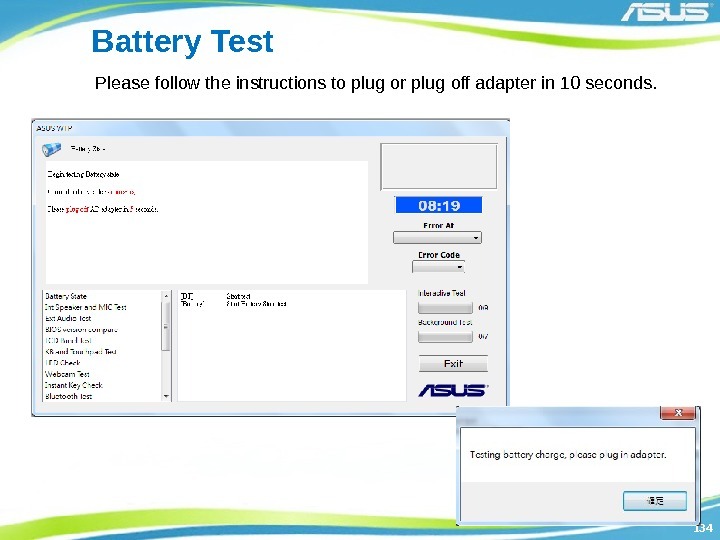 134134 Battery Test Please follow the instructions to plug or plug off adapter in 10 seconds. 135135 Internal Speaker and Microphone Test 1. You can press F 10 to trigger a FAIL at any time. 2. 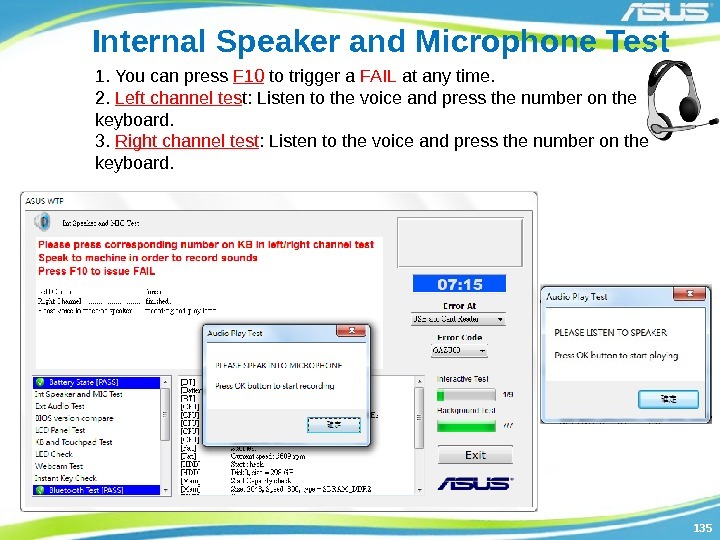 Left channel tes t: Listen to the voice and press the number on the keyboard. 3. 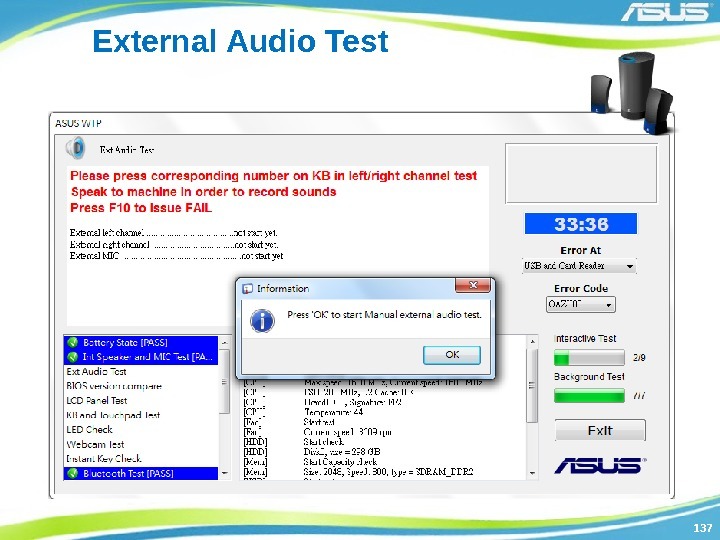 Right channel test : Listen to the voice and press the number on the keyboard. 136136 Internal Speaker and Media Test 4. Microphone Test : Please speak into microphone and press ok button to recording. Please listen to speaker and press ok button start playing. 5. Manually press PASS, FAIL, and RETRY depending on the result. 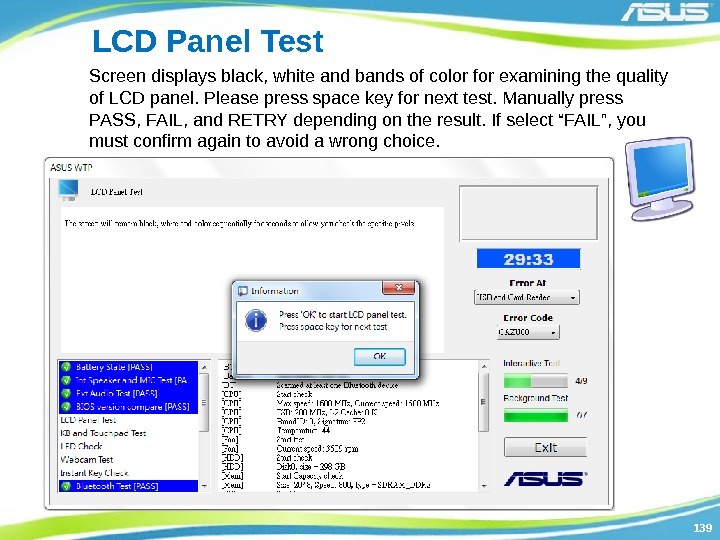 If select “FAIL”, you must confirm again to avoid a wrong choice. 6. 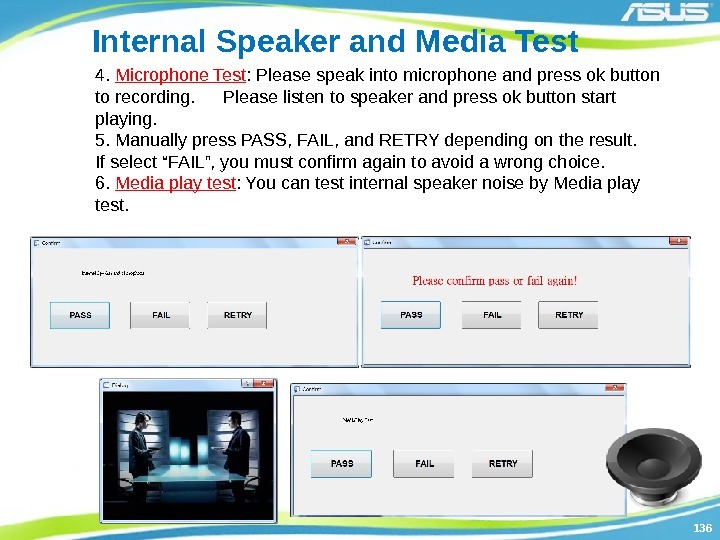 Media play test : You can test internal speaker noise by Media play test. 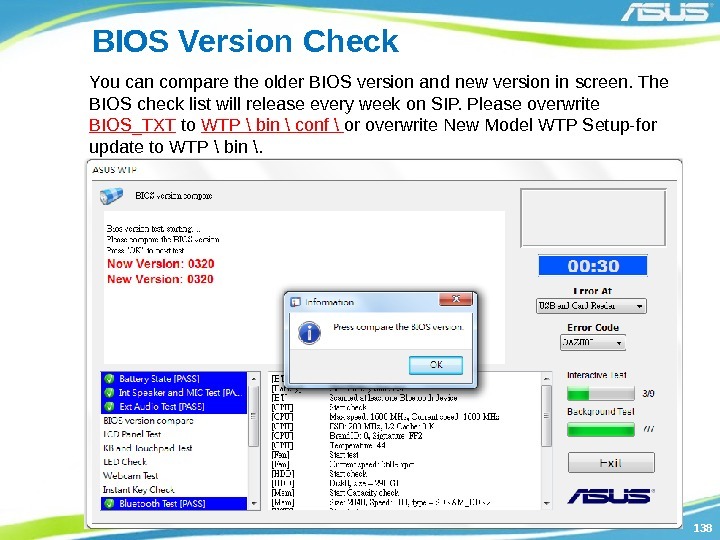 138138 BIOS Version Check You can compare the older BIOS version and new version in screen. 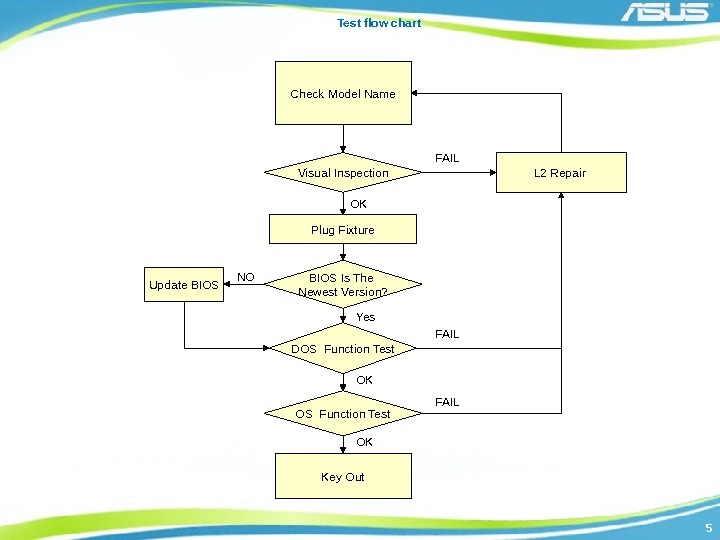 The BIOS check list will release every week on SIP. 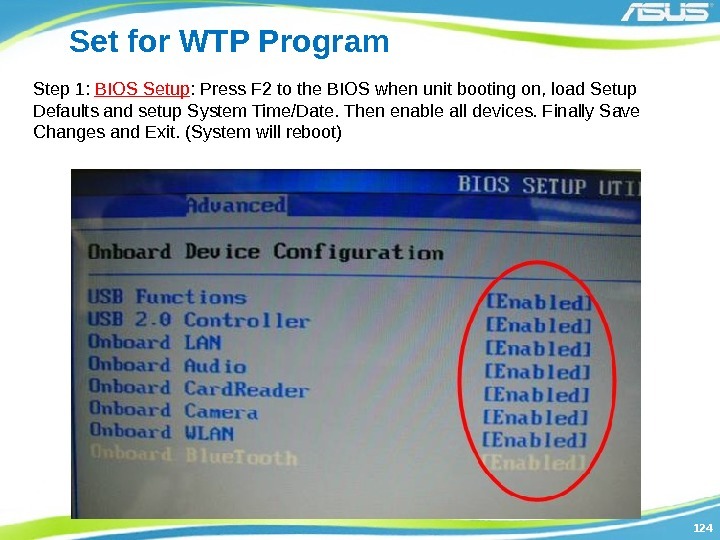 Please overwrite BIOS_TXT to WTP \ bin \ conf \ or overwrite New Model WTP Setup-for update to WTP \ bin \. 140140 Keyboard Test Please select the language. Click all the keys on the keyboard. For [Fn] key on the left, press [Fn] and [Del]. For [Fn] key on the right, press [Fn] and [Ins]. 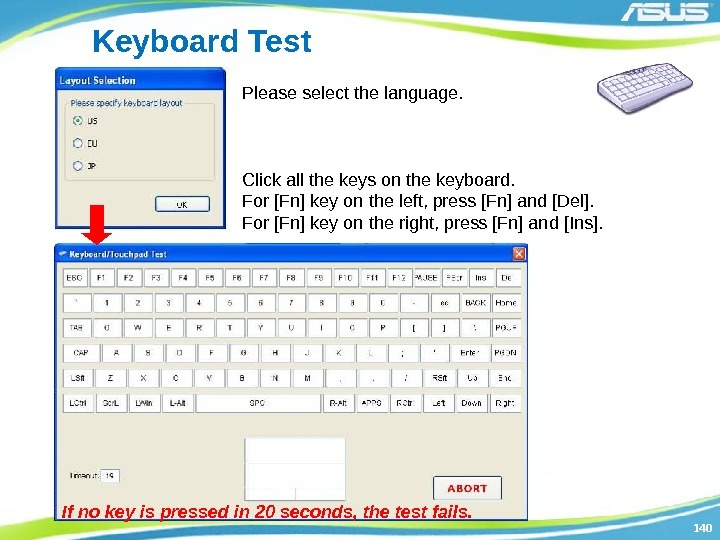 If no key is pressed in 20 seconds, the test fails. 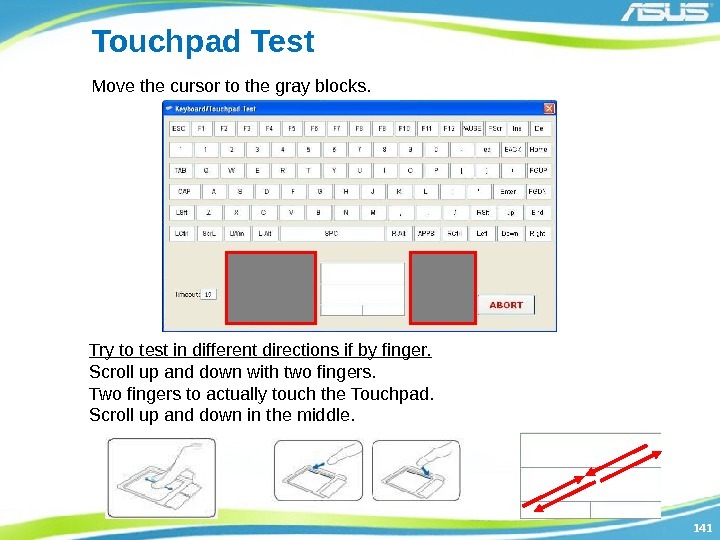 141141 Touchpad Test Move the cursor to the gray blocks. Try to test in different directions if by finger. Scroll up and down with two fingers. Two fingers to actually touch the Touchpad. Scroll up and down in the middle. 142142 LED Test Press “ Next ” button and watch the LED make sure they blink. 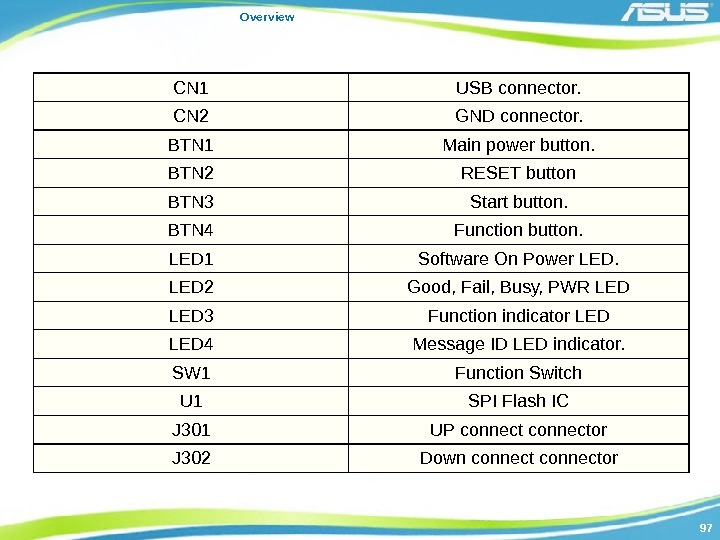 If the LED does not light up, press fail and may repeat the test again to ensure the LED actually failed. 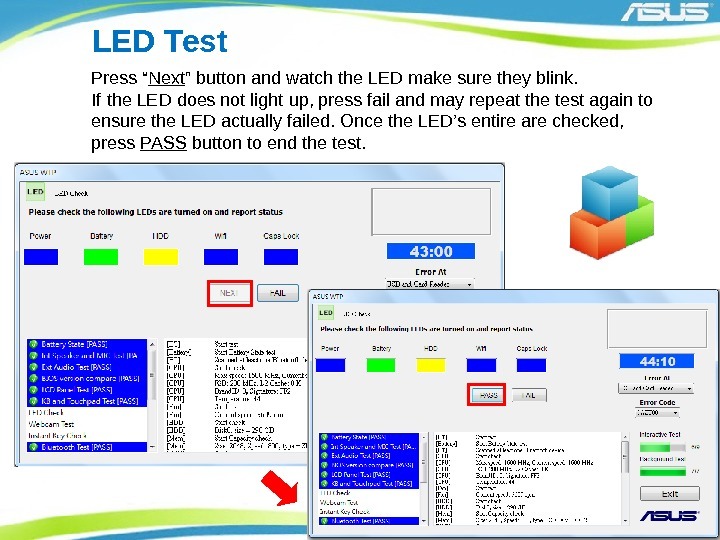 Once the LED’s entire are checked, press PASS button to end the test. 143143 Webcam Test Once the image shows up, please wait 5 seconds to end the test. If single test, please press space key to end the test. Manually press PASS , FAIL , and RETRY depending on the result. 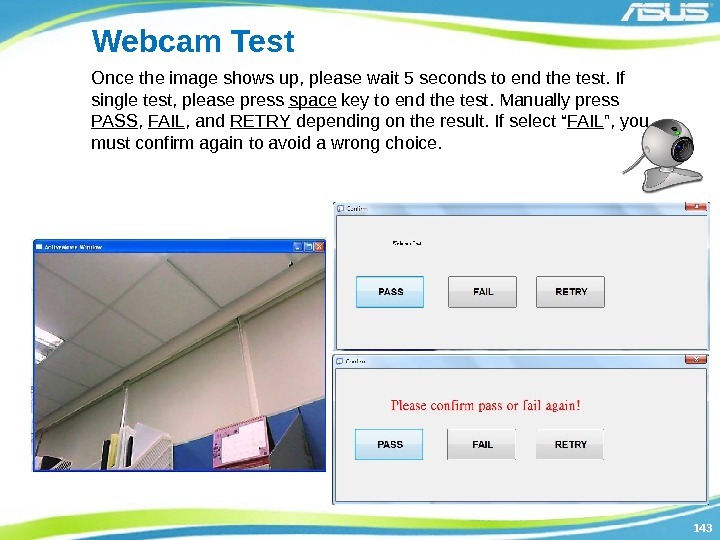 If select “ FAIL ”, you must confirm again to avoid a wrong choice. 144144 Instant Key Test Press the instant keys and make sure the color turns from black to blue. 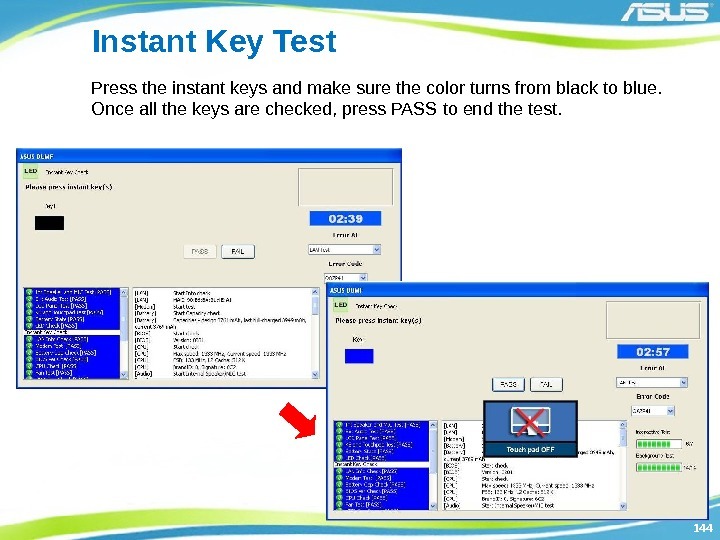 Once all the keys are checked, press PASS to end the test. 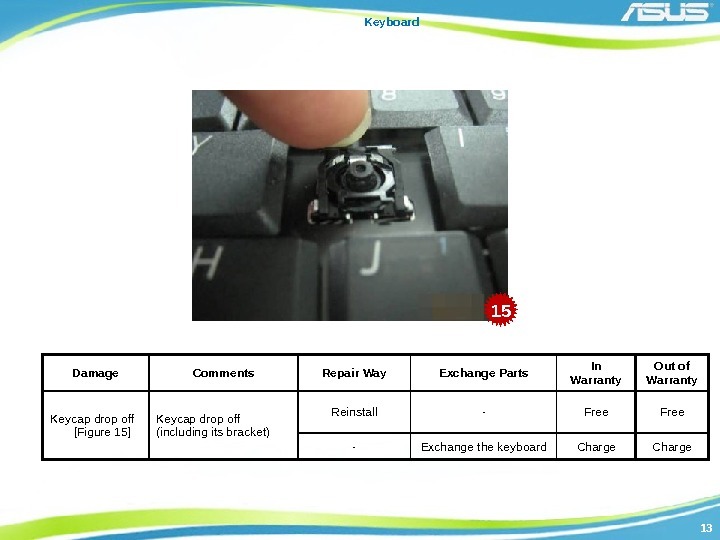 145145 Instant Key Test Press the instant keys again to turn touch pad on. 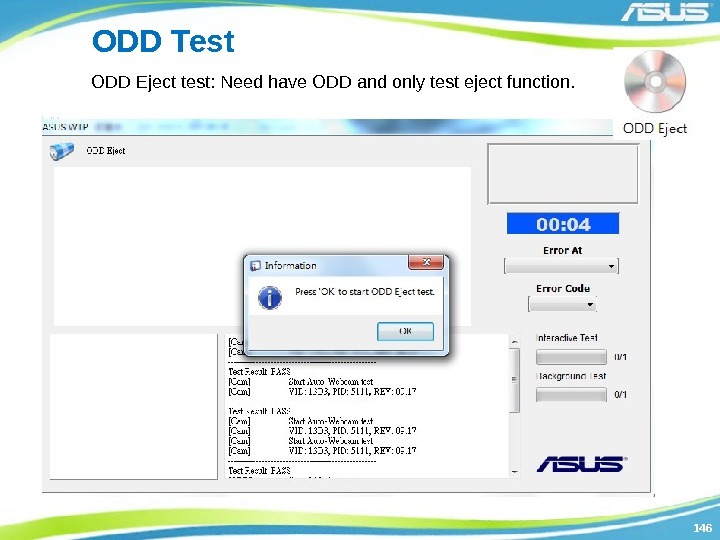 146146 ODD Test ODD Eject test: Need have ODD and only test eject function. 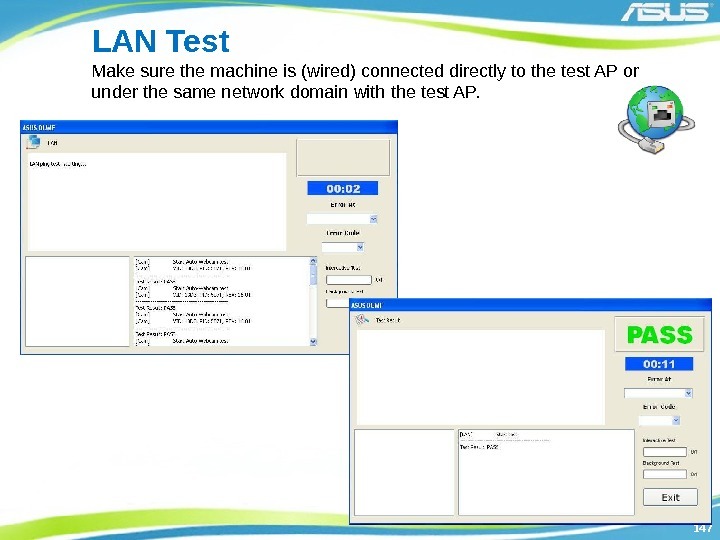 147147 LAN Test Make sure the machine is (wired) connected directly to the test AP or under the same network domain with the test AP. 148148 WIFI Test Make sure to setup the AP with SSID as “ tc_test ” without encryption before performing the test. 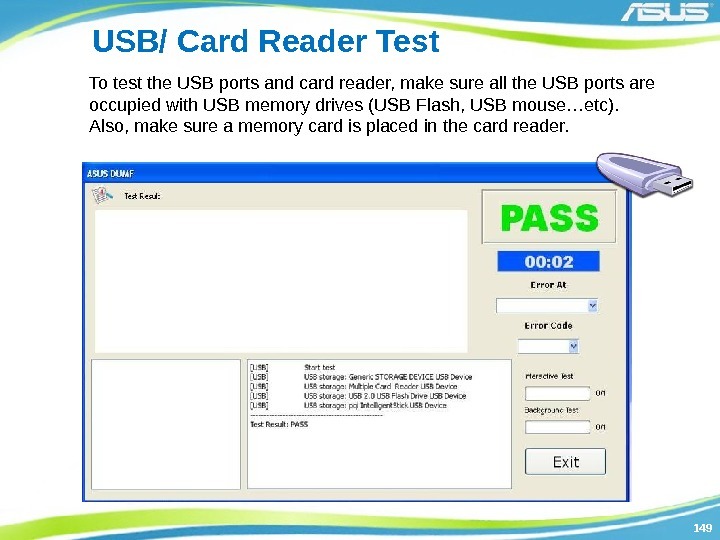 149149 USB/ Card Reader Test To test the USB ports and card reader, make sure all the USB ports are occupied with USB memory drives (USB Flash, USB mouse…etc). 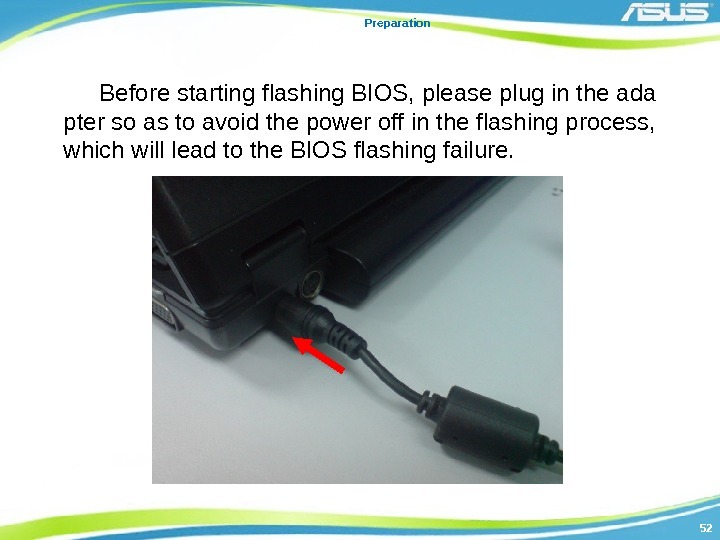 Also, make sure a memory card is placed in the card reader. 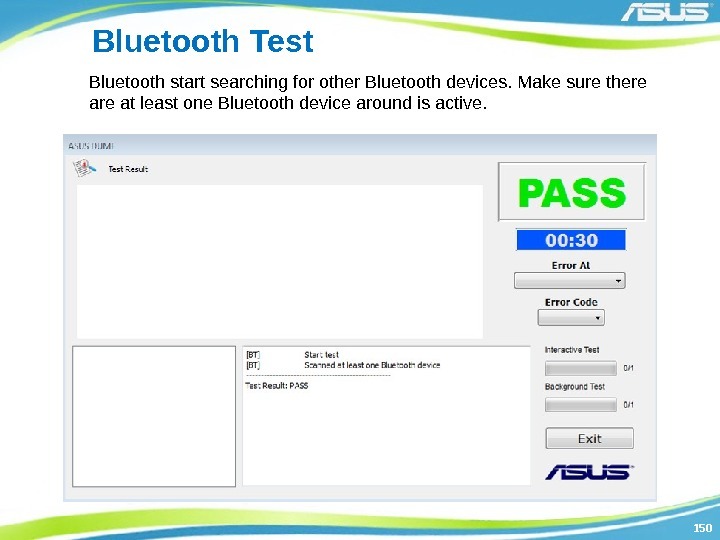 150150 Bluetooth Test Bluetooth start searching for other Bluetooth devices. Make sure there at least one Bluetooth device around is active. 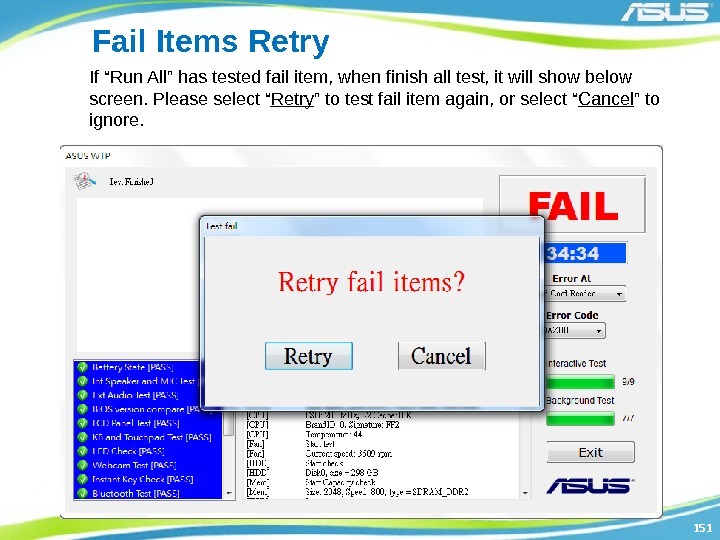 151151 Fail Items Retry If “Run All” has tested fail item, when finish all test, it will show below screen. Please select “ Retry ” to test fail item again, or select “ Cancel ” to ignore. 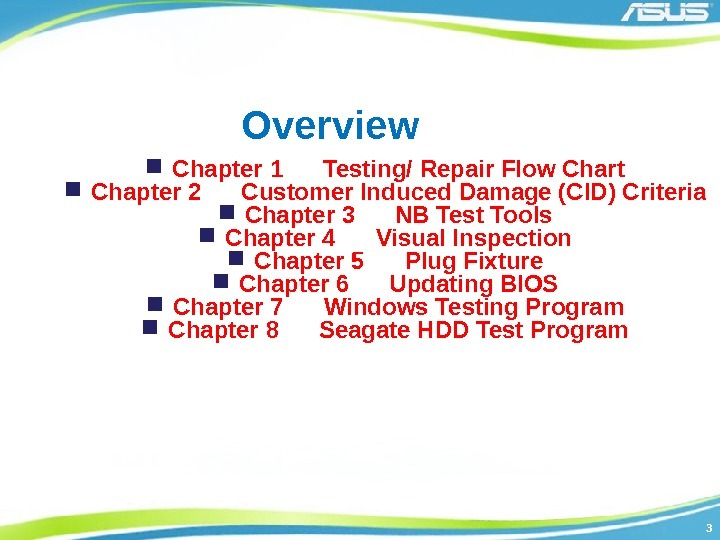 152152 Test Report If all tests pass, it will show below picture. Press “ Exit ” button end of the test program. 153153 Test Report Test result is listed here with PASS or FAIL recorded. Press “ Print ” to print out the result or “ Close ” to close the window. If you “ Close ”, report will auto save. 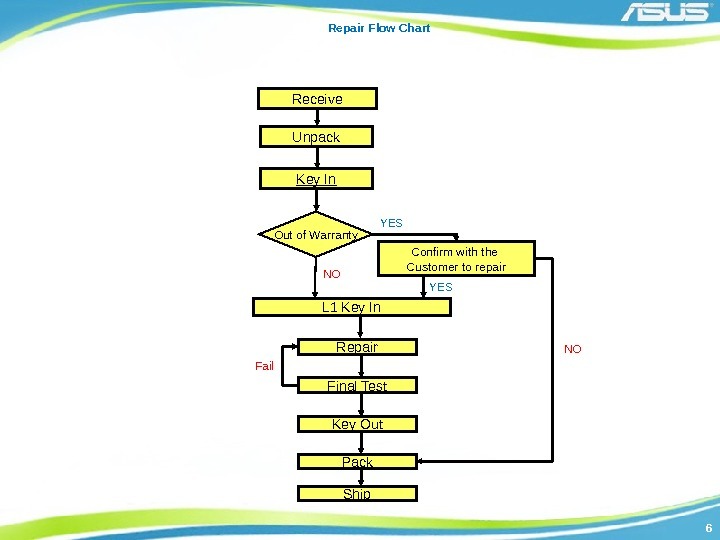 Please refer setup ( 10. 2 Setting report save path ). 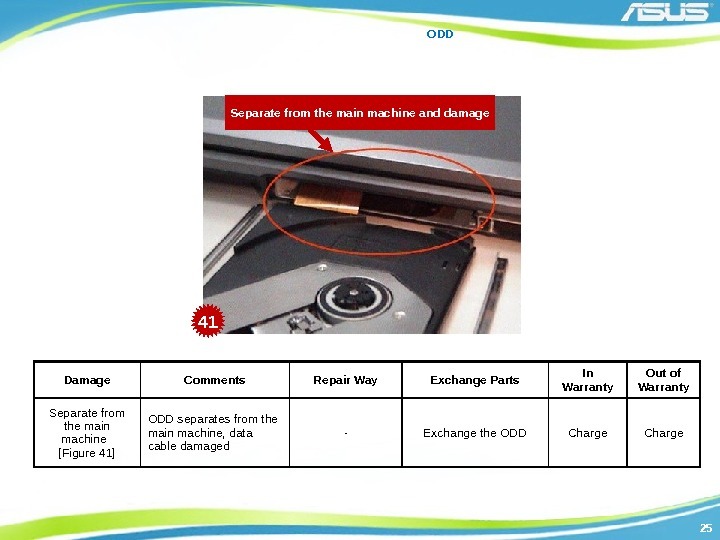 Open file to check test result. 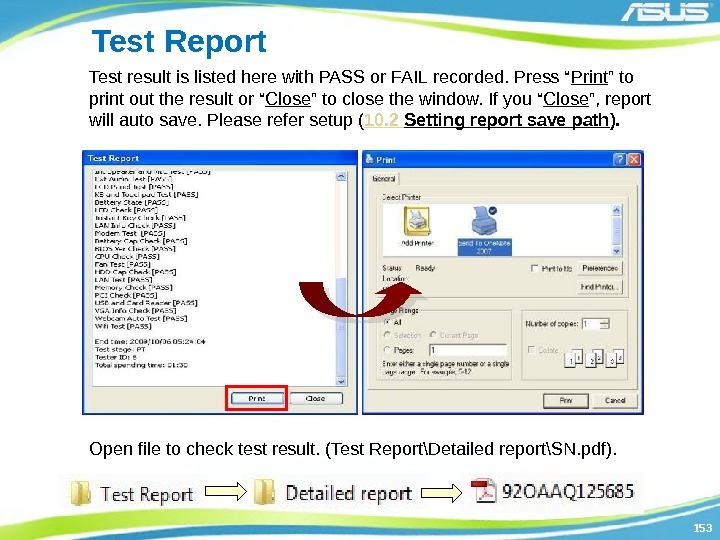 (Test Report\Detailed report\SN. pdf). 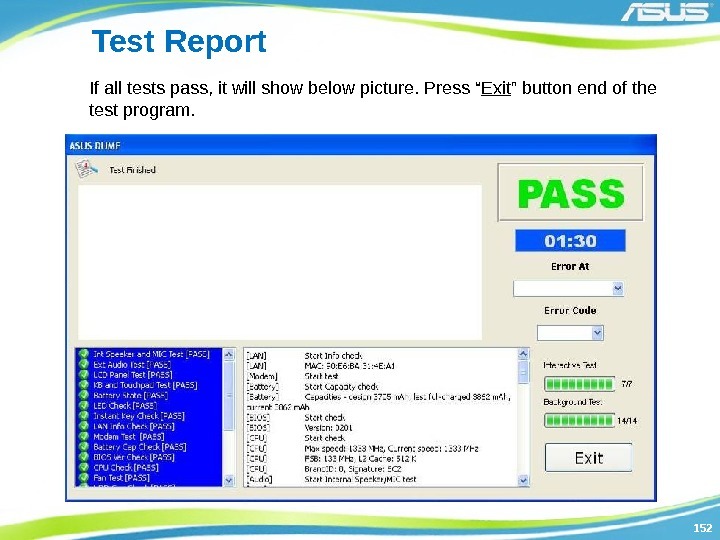 154154 Advance Test We provide an interface that can link to your favorite programs. Please use the copyrighted program. We have provided a number of programs available for your use. 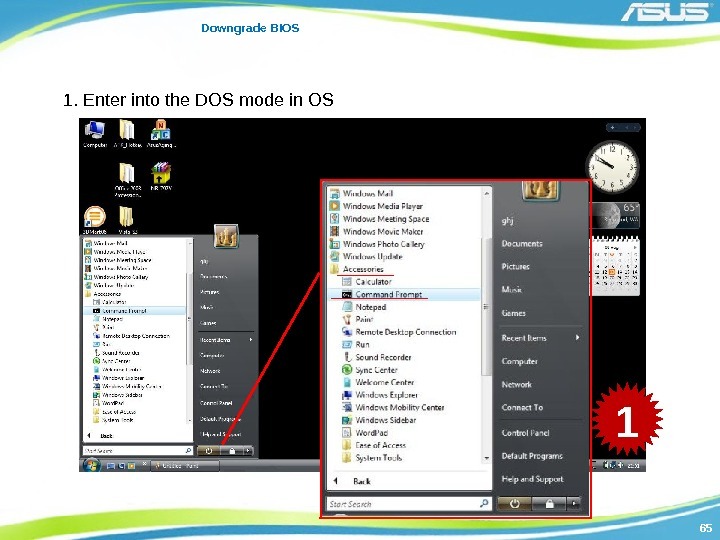 The following describes how to add and delete programs. 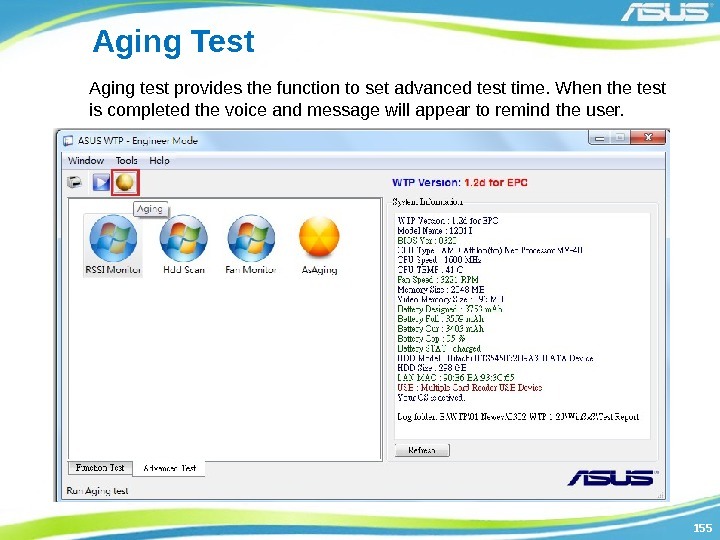 155155 Aging Test Aging test provides the function to set advanced test time. When the test is completed the voice and message will appear to remind the user. 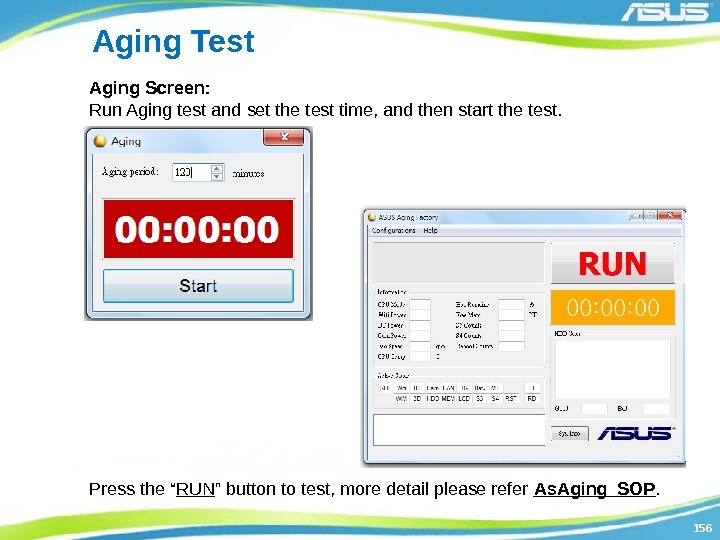 156156 Aging Test Aging Screen: Run Aging test and set the test time, and then start the test. 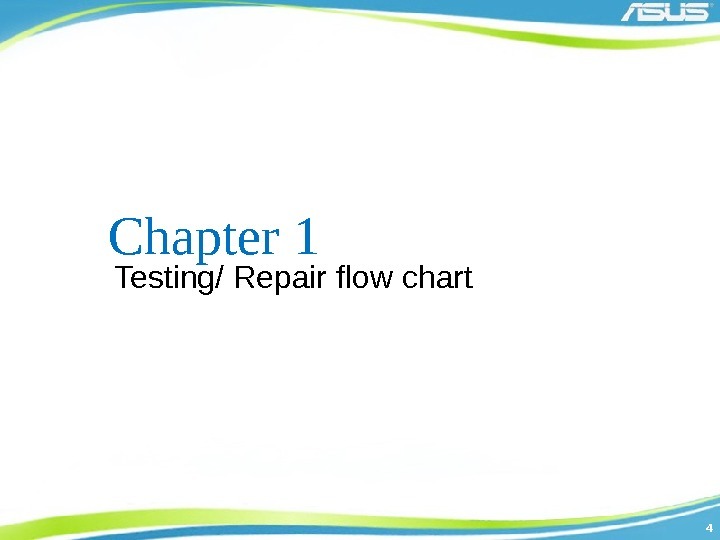 Press the “ RUN ” button to test, more detail please refer As. Aging_SOP. 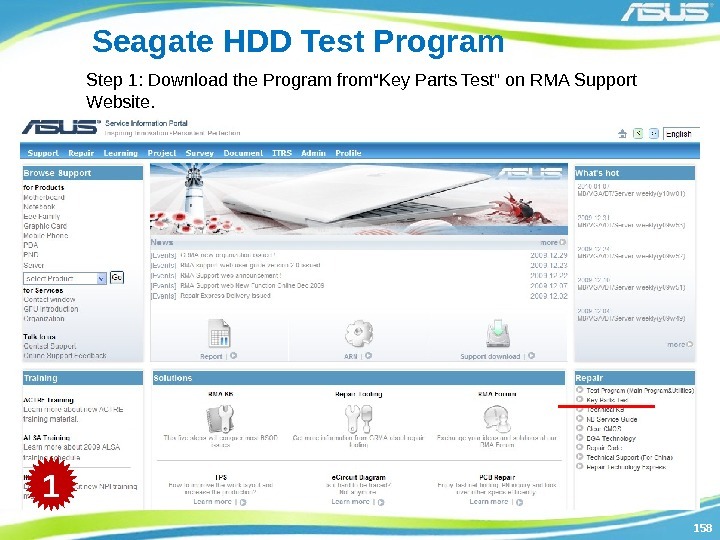 158158 Seagate HDD Test Program Step 1: Download the Program from“Key Parts Test» on RMA Support Website. 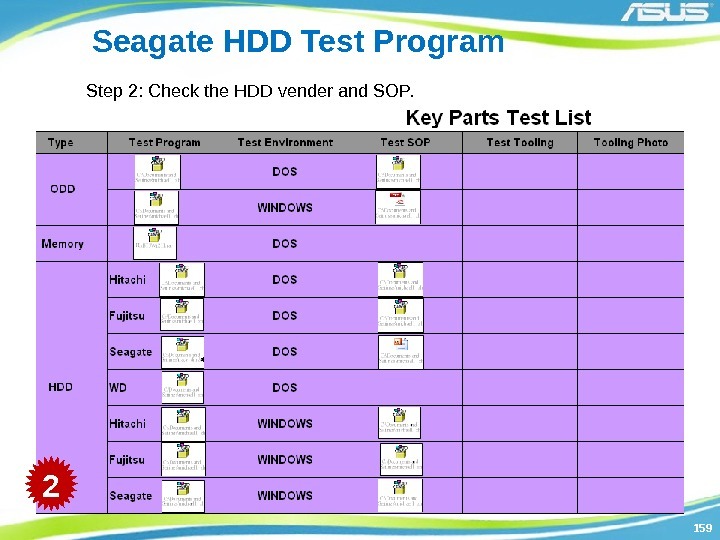 159159 Seagate HDD Test Program Step 2: Check the HDD vender and SOP. 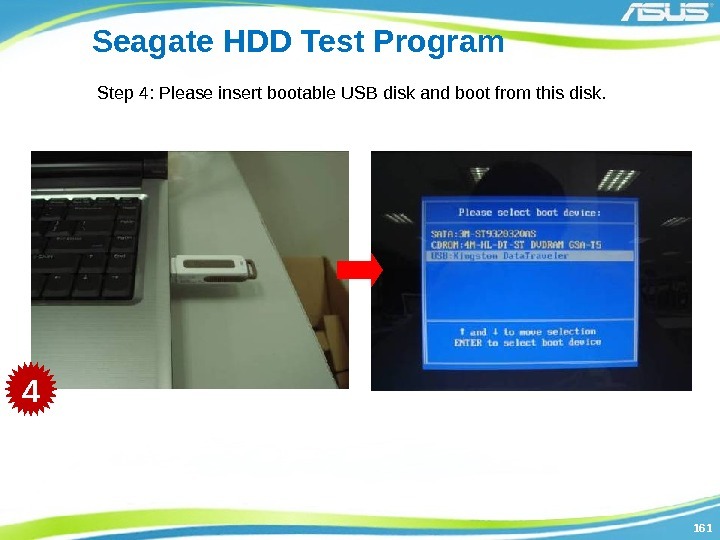 161161 Seagate HDD Test Program Step 4: Please insert bootable USB disk and boot from this disk. 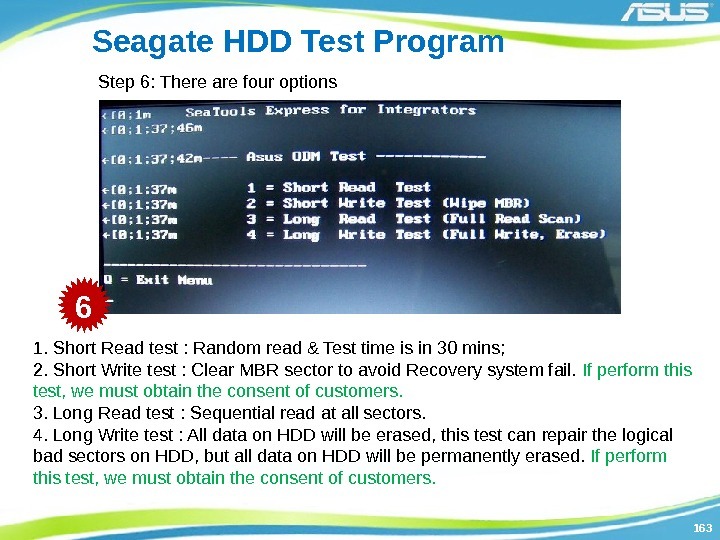 163163 Seagate HDD Test Program Step 6: There are four options 1. Short Read test : Random read & Test time is in 30 mins; 2. Short Write test : Clear MBR sector to avoid Recovery system fail. If perform this test, we must obtain the consent of customers. 3. Long Read test : Sequential read at all sectors. 4. 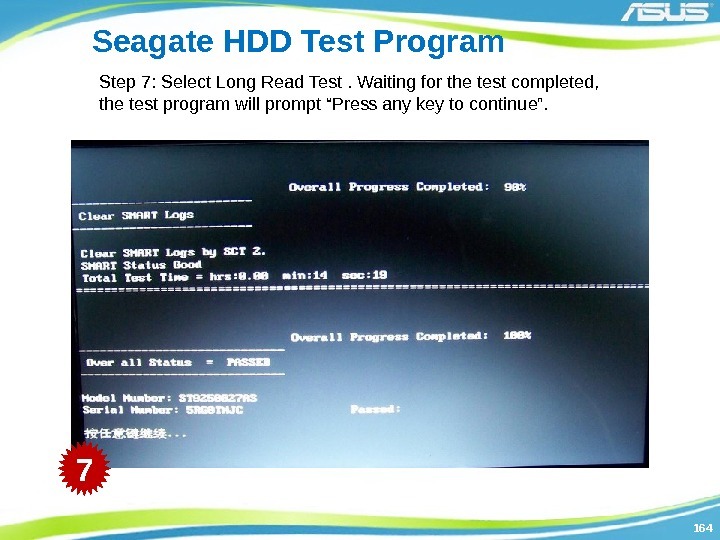 Long Write test : All data on HDD will be erased, this test can repair the logical bad sectors on HDD, but all data on HDD will be permanently erased. If perform this test, we must obtain the consent of customers. 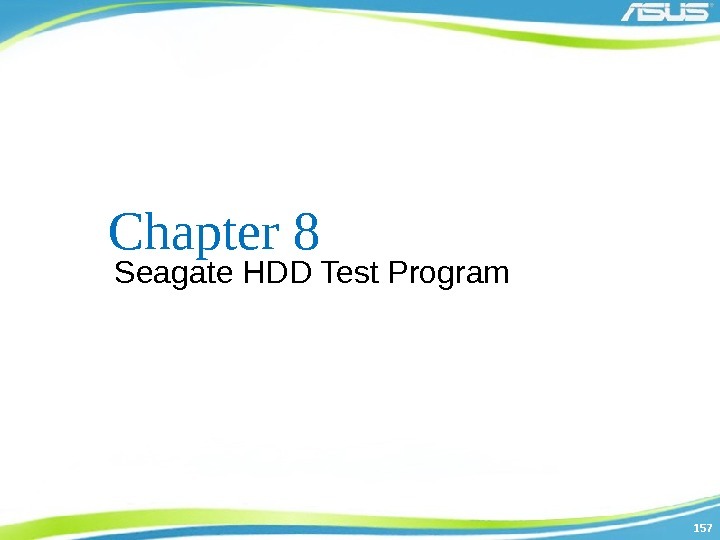 164164 Seagate HDD Test Program Step 7: Select Long Read Test. 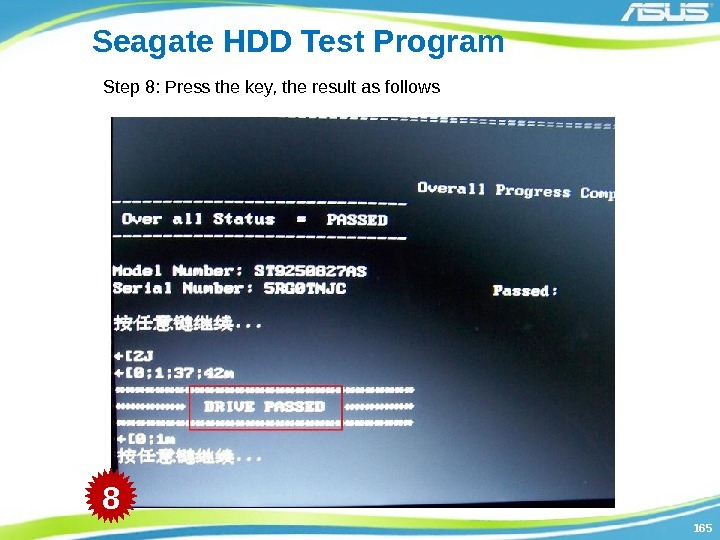 Waiting for the test completed, the test program will prompt “Press any key to continue”.